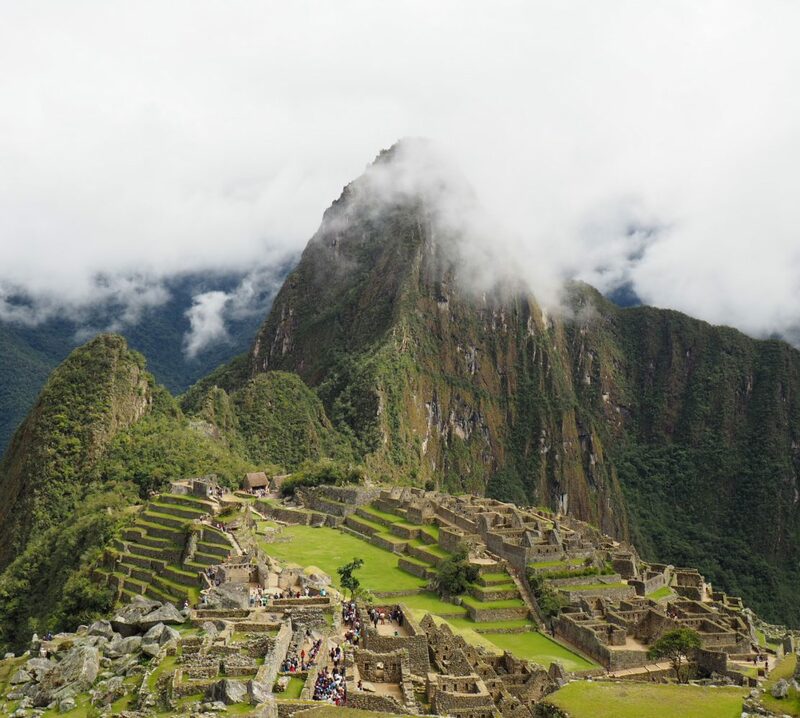 Our next trip: Wandering South America! Since India, a quick update. Disclaimer: this travel blog was from August 2017. The very last part of our 5-month trip around Asia was spent in Hong Kong. Instead of a lengthy blog post, we thought we’d put in a few highlights of the few days we spent here before returning back to the UK. Highlight 1 > the food, especially the Dim Sum! We loved Dim Sum Square and Cantom Dim Sum Expert. For huge portions of dinner (not Dim Sum) Tsui Wah was a good shout and fairly cheap too. Offering incredible views over Hong Kong we would recommend the hike. We got a bus to the start and walked to the view point. The seated Buddha was a little out of town but experiencing the glass floor cable car was really cool. To get the seated Buddha there are quite a few steps up, however, the views were amazing, oh and the Buddha is huge! Highlight 4 > going to Macau for the day! We took the first boat out from Hong Kong and the last boat back. Macau is like the Vegas of Asia but also has a cute Portuguese town as well. It was definitely worth a visit! We managed to get a free open-top bus tour of the city because some travellers hadn’t planned their time properly. We also took the peak tram with the sky pass to get the view over Hong Kong. Disclaimer: This blog post is referring to travels in August 2017. Bali, Lombok and the Gili Islands. For the Indonesian part of our trip, we visited Bali, Lombok and the Gili Islands. We’d wanted to go to Java to visit Mount Bromo and Komodo Island but time and money were both running out. We visited Bali at the start and end of our trip to Indonesia, but for this blog post we’ll bung all the Bali destinations together. As you can see we barely scratched the surface of Bali. We tended to stay in the tourist spots which meant it was easy to get between them via buses. Our first stop was Kuta. It hasn’t got the best reputation but we wanted somewhere close to the airport on a small budget. Despite it being touristy (and busy), it meant there were lots of shops and restaurants. We enjoyed doing random things like going to the cinema and Jonny was delighted to find an English roast dinner one evening. A happy Jonny with his roast dinner. Smoothie bowls here were also very tasty for breakfast. Tregallalang was a complete contrast to Kuta, with a village-feel, surrounded by rice paddies. It was very peaceful. We stayed in a homestay with a lovely family who cooked breakfast for us each morning and lent Jonny a guitar to play. From here we could visit the rice terraces, go coffee tasting and experience white-water rafting. We stayed at Ubud Sawah Homestay which was actually not in Ubud centre but a small village close to the rice terraces. It was a good base for white-water rafting too! The Tegalalang rice terraces, which were pretty spectacular. This is a big tourist spot however. If you’re going to Bali, it would be hard not to stay at Ubud at some point during your trip. It acts as a great hub for a number of activities and is packed with restaurants, Yoga classes and fresh & organic foods. We enjoyed relaxing by the pool at Raka & Rai bungalow (cheap private room with a lovely breakfast). We loved Kafe in Ubud for the fresh meals! Whilst in Ubud we walked some of the Campuhan Ridge Walk which escapes the crowds and has nice views over Bali. Walking the Campuhan Ridge from Ubud. There is a forest in Ubud which is home to lots of monkeys within walking distance. From Ubud, we decided to take an early morning trip to climb Mount Batur, which is an active volcano in Bali. We set off at 4am to reach the peak for sunrise. Sadly the clouds only broke for one brief moment revealing a glimmer of sunshine and views. The hike up itself wasn’t so bad, it’s 1717m high. It did get tougher towards the top however as it was mainly sand which meant for every step forward you slipped 3 back. You could also see steam and hardened volcanic ash during the climb which was really cool! Climbing Mount Batur, an active volcano 1,717m high. A glimpse of sunrise from the summit. The next place in Bali we stayed at was Canggu which is near Echo beach. Here the sand is black and it was very popular with surfers. The town had a chilled out vibe, and we even went to a local farmers market during a weekend morning. Our last beach stop was at Nusa Dua. We stayed in a nice hostel and rented sun beds from a hotel on the beach. We pretty much took most of this time to relax on the beach, with the occasional sing-song to the locals with Jonny and his ukulele. The golden sands of Nusa Dua. We stayed at aptly named “Cheap Hotel”. To get to Lombok you have to get a ferry, and from Bali there is a fast and slow boat. Unfortunately, the seas were rough which meant only the slow boat was running. It felt really slow and cramped, so slow that I read all of Orwell’s 1984 during the boat ride. We stayed in Kuta in Lombok. Once we finally arrived, we stayed at Kuta beach (a far cry from from Kuta in Bali). The beach itself had spots which were barely populated but absolutely stunning. This is definitely going to become popular in a few years time! We walked most of the beach, down the main end it’s a good place to learn to kite-surf. Kuta beach in Lombok. Barely anyone around! The best thing about our walk along this beach was when we walked to the end and a litter of puppies came to say hello and then promptly fell asleep on me. This moment deserves a single photo collage. Our accommodation was a cross between a homestay and a hostel called Join Homestay. There was a cat who befriended us and sat on our porch daily and chickens running freely around the garden. I went on a run one morning and got completely lost as paths merged into people’s back gardens. Everything was very open here which gave us the sense you could trust people. There was a great viewpoint we went to on bikes and a nice yoga retreat called Ashtari cafe for dinner to watch the sunset. We took a bike to Merese Hill viewpoint (the local kids loved the bike). The views were worth the trip! Recommend Ashtari cafe for dinner (also a Yoga retreat). Next, we got a boat over to the Gili islands. The Gili islands were probably my favourite part of Indonesia. Being a total beach bum, and loving snorkelling and diving, the Gilis were perfect. The three Gili Islands off the coast Lombok. We stayed on the busier island of Gili Trawangan or Gili T as it is affectionately named. This is the biggest of the three islands and it has no cars or motorbikes which can be a welcome relief from Bali (where you have to be on guard for motorbikes all the time). There are also no dogs on the islands, only cats. Pituq cafe became one of our favourite lunch and breakfast spots serving delicious smoothie bowls and veggie wraps. We wasted no time on arrival to Gili T by getting our swimwear on and diving straight into the sea. The snorkelling was excellent with very good visibility. I saw a turtle and a school of squid on our first swim! 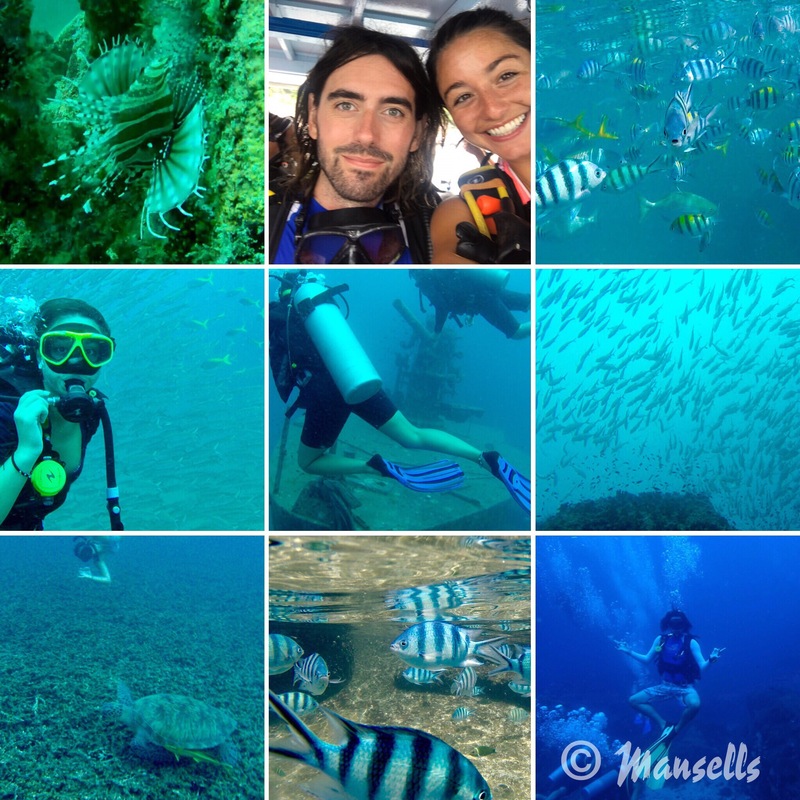 We took one scuba dive during our stay and saw reef tip sharks along with countless turtles. To get around the island we hired bicycles (less than £2.50 per day) and cycled around the island stopping along the way. There were some great restaurants and bars on the west side to watch the sunset. Gili T – what an incredible island. This place is popular for a reason! We spent two days visiting the other two islands: Gili Air and Gili Meno. There was a public ferry twice a day operating between the islands that cost £1.50-£2 each way. Gili Air was a little quieter than Gili T with great snorkelling and a great chilled vibe. We spent the day lounging around before walking around the island. Gili Meno was the most remote island but had the best snorkelling in our opinion because we saw three turtles, two octopus, starfish and lots of beautiful fish. The downside was there was less choice of restaurants. As you walked more around the island you could find beautiful isolated beaches but you’d want to bring food and drinks with you as there were no shops and restaurants in some parts of the island. The incredible beach of Gili Meno. Beautiful white sandy beaches and perfectly clear waters- a picture perfect postcard of paradise. ﻿Disclaimer: This blog post is referring to travels in July 2017. It felt like we were in Singapore much longer than we actually were. We really liked how walkable the city was which meant we could cram quite a lot in. 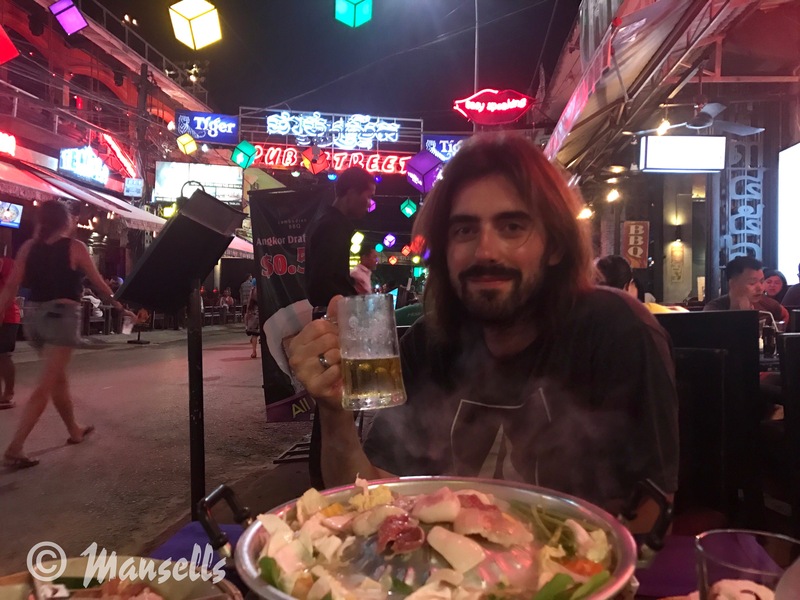 Although it is more expensive, we actually managed to stay close to our backpacker budget by making the most of the free activities on offer and eating street food. After travelling from Melaka in the morning, we had 1.5 days to explore before our flight to Bali. We stayed near Bugis Junction (a shopping centre) in a small backpacker guesthouse because it was the cheapest place we could find. It actually turned out to be a great location because we were within walking distance of most the things we wanted to see. The restaurant below the Guesthouse called Seng Huat Coffee House had great food, in fact there was often a queue down the street! The small but busy Seng Huat Coffee House bear Bugis Junction. 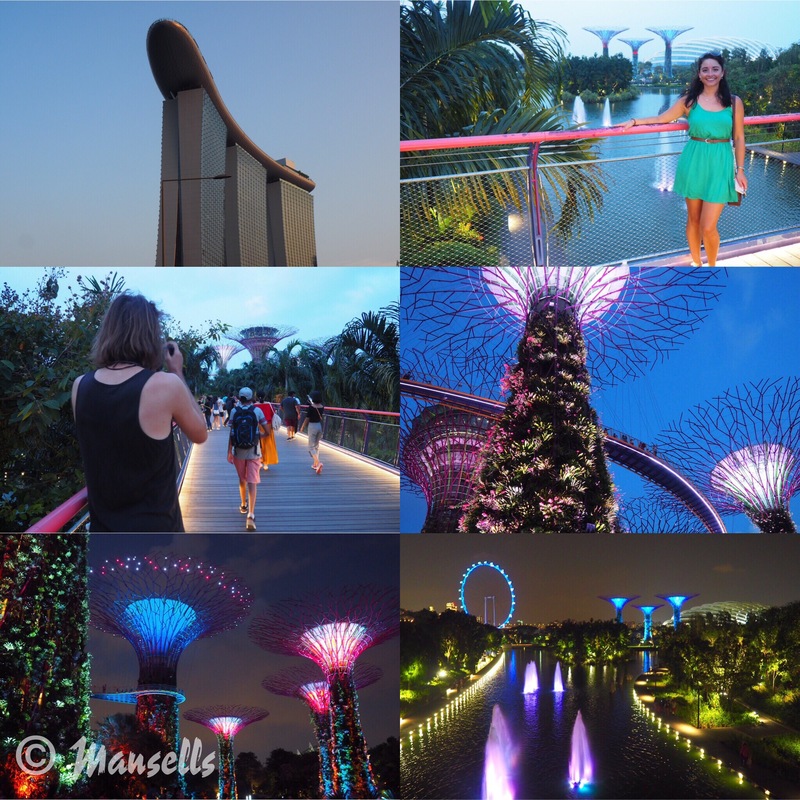 On our first evening we wandered down to the Gardens by the Bay to enjoy the light show which occurs most evenings. It is accompanied by music (this time it was musical theme). It looked very pretty. Gardens by the Bay light show runs almost every evening. You can watch it for free at ground level. Afterwards, we went to Boat Quay for drinks with Oonagh, a friend from Worthing now living in Singapore. 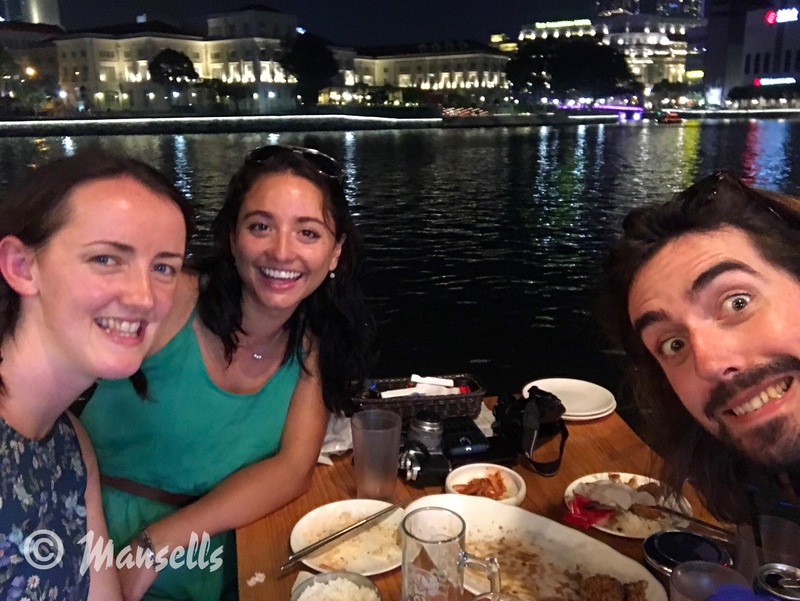 Boat Quay – a popular outdoor eating/drinking spot, particularly with expats. The next day, we were up early to explore but the heavens opened so we had to wait it out a while and decided to look at the free shark exhibition at Park House. 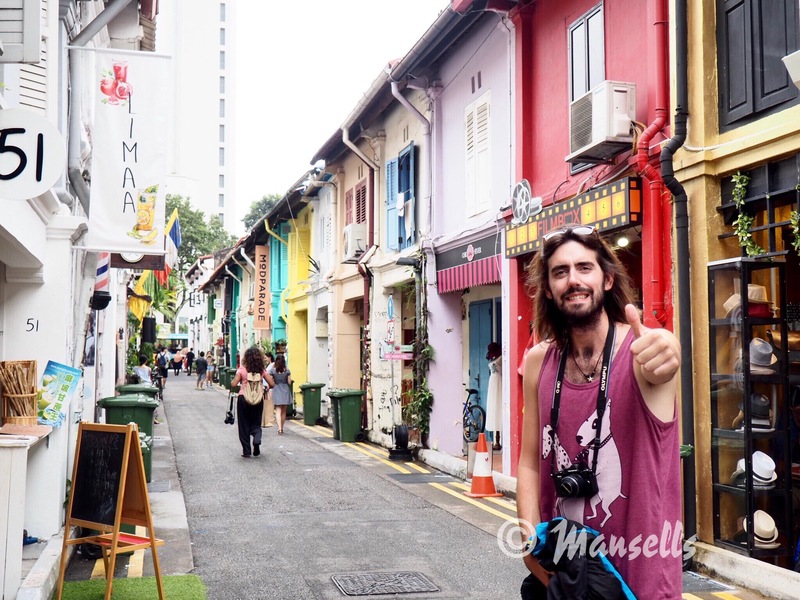 Once the rain had eased off, we wandered through the colourful houses and little shops on Haji Lane and Arab St.
Next on the list was Little India with the most colourful buildings. Mustafas, a department store, felt more of a bizarre with absolutely anything and everything inside from gadgets & gizmos to body lotions and potions. Not to mention every type of biscuit and chocolate you could want – it’s worth a peek inside. 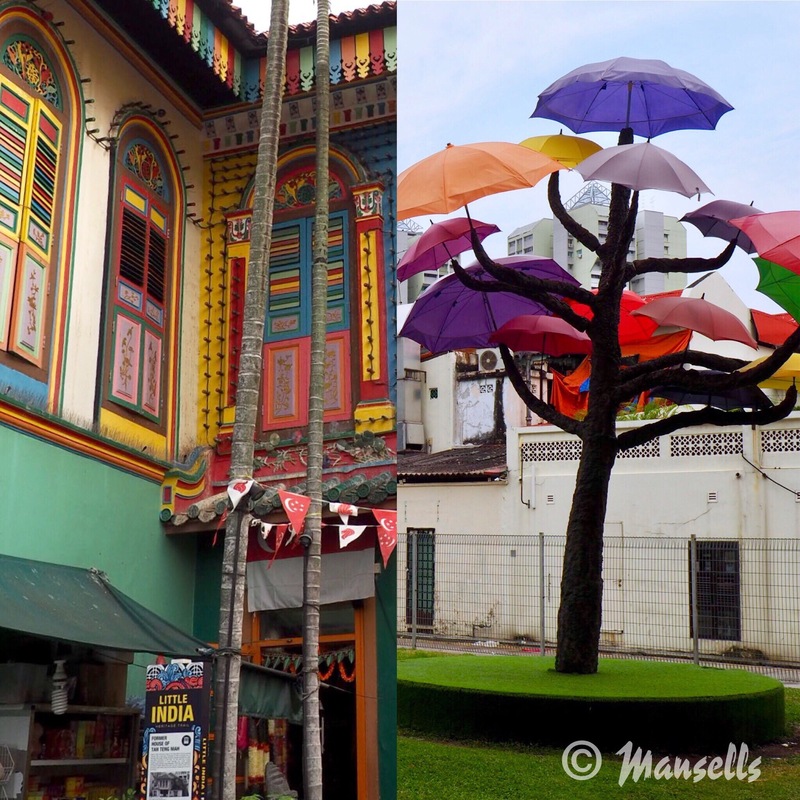 All the colours around Little India. Our third stop was Chinatown. 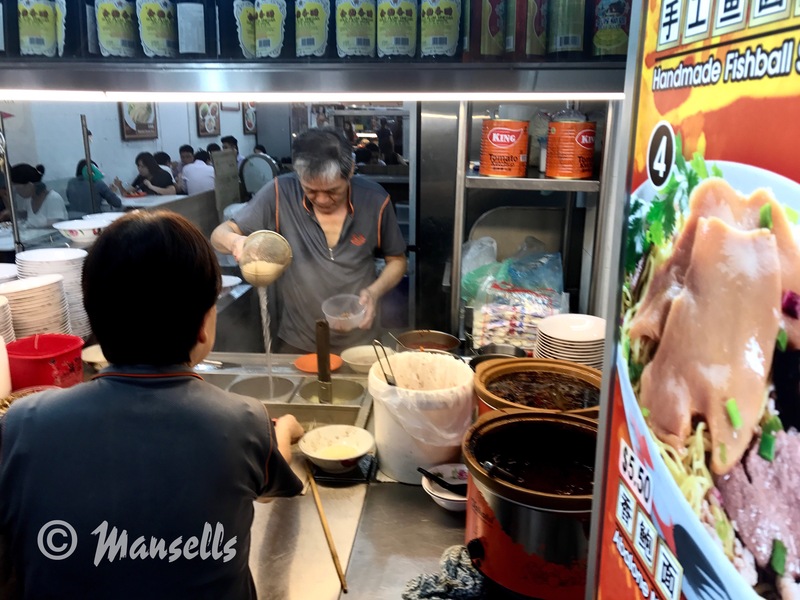 We took the metro to save time and enjoyed sampling some of the street food at the many hawker stalls here. 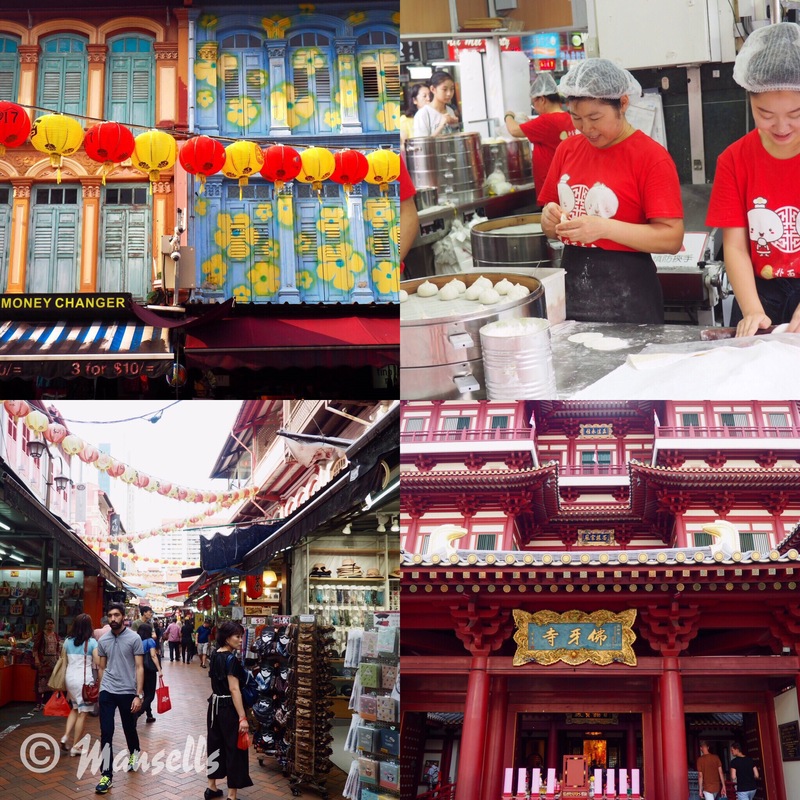 Chinatown is definitely a good place to visit if you’re on a budget. Good food and lots to look at/explore. In the evening, we walked to the Merlion and watched the light show in Marina Bay. For a free show it was pretty spectacular! The free light show at Marina Bay. Our flight to Bali was at 5am the next morning, which meant we had to leave for the airport at 2am. Having been busy sightseeing, we’d not booked any accommodation for Bali so it was a bit of a last minute scramble and very little sleep! ﻿﻿Disclaimer: This blog post is referring to travels in July 2017. It was a brief visit to Malaysia but we enjoyed every minute. After the night train from Thailand, we made our way to George Town. 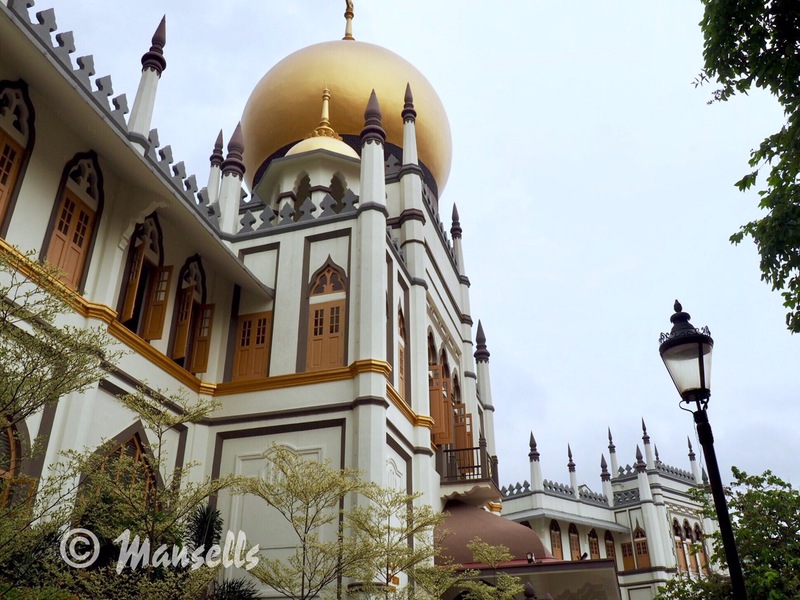 ﻿A UNESCO heritage Town in Penang, George Town was such a good spot for travellers. The town itself is very walkable, making it ideal for those on a budget. We didn’t have much time to do our research before we arrived but just by wandering around we stumbled upon beautiful old Chinese architecture, endless cafes and incredible street art. This is a hipsters playground. George Town was even home to a Cat Cafe where we lost pretty much lost an entire morning to the cats. The Cat Cafe in George Town. For something different, we visited the Tech Dome which had a laser maze, climbing wall and a vertical free fall drop. Josh did so well on the climbing wall, Jonny needed some attention in the laser maze. Food wise, the night hawker stalls were a good option with freshly made satay chicken skewers. On our last day in George Town, we strolled through the free Botanical Gardens. The monkeys picked on unsuspecting tourists planning to eat in the gardens- not cool if you were said tourist but otherwise providing further free entertainment for us. Note: do not bring food into the Botanical Gardens. The free botanical gardens near George Town, Penang. Chew Jetty should probably get a shout out because it is entirely built upon handmade stilts, literally buckets of concrete. It reminded me of a smaller and much more authentic Pier 39 in San Francisco with all the little shops and stalls. Exploring Chew Jetty. We decided to mark the occasion with henna tattoos. We caught a bus to Kuala Lumpur and stayed near Central Market which had lots of shops and stalls (great for buying souvenirs/gifts) and food places. On the outskirts of Kuala Lumpar was Batu Caves. They were easy to get to as they were situated at the end of the metro line, but remember to save all your energy for the steps! Batu Caves near Kuala Lumpur. We visited the Petronas Towers at dusk to watch the transition from day to night when the towers light up. Then it was time for our last supper with Joshua before he sadly departed back to the UK. The mighty high Petronas towers in KL. We took the morning bus to Melaka so we had all afternoon to explore. Melaka is another UNESCO world heritage site in Malaysia due to beautiul old architecture. We really enjoyed this town; the quaint streets, boat ride down the river, the red square and street art made it a great place for an afternoon visit. The colourful town of Melaka. We ate at two really yummy places: Kocik Kitchen and Calanthe Art Cafe. I had a Laksa curry at both I loved the dish so much- a lovely coconut based soup with noodles. I had both a prawn and chicken one and both were great. Brits get a 30-day visa exemption for Thailand which makes it a popular destination for holiday makers, gap-year students and travellers. Not to mention the cost of living is low, the weather is great almost all year round and Thailand hosts some of the best beaches in the world. So it’s no surprise that it can feel like half of Blighty are there with you. Safe to say we were a little apprehensive about visiting Thailand. However, contrary to our initial apprehension we were left wanting more! As a self-confessed beach bum, the majority of our time was spent island-hopping in South Thailand. And boy, is there a lot of islands – some completely deserted. Even the secret paradise beach that Leonardo Dicaprio found in the film ‘The Beach’ can be located in South Thailand – though that beach admittedly is quite touristy now. One month of travel distilled into nine photos. Tricky. 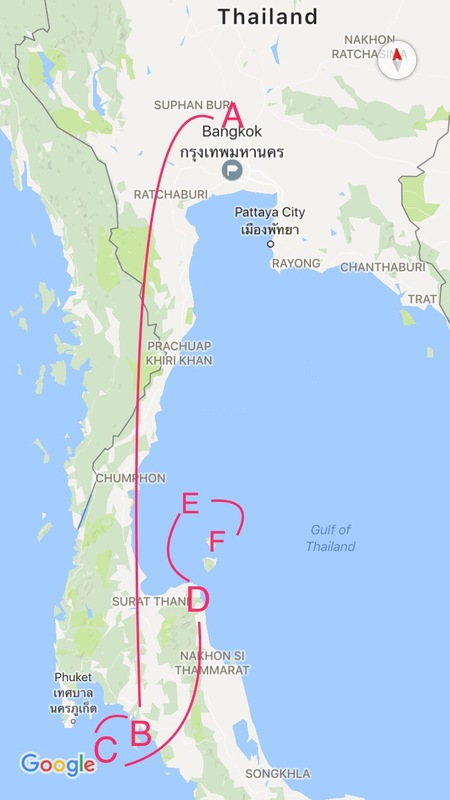 I couldn’t produce the usual Google map route because we visited islands in Thailand, so instead you have this amateur markup. Plus 1 night on the overnight train to get to the Thai/Malaysian border. The Thai food had to be one of the cuisines we were looking forward to the most and on the whole it didn’t disappoint but watch the chili- it blew India out the water. Thai food was very tasty as long as it was of a ‘Farang’ or foreigner spice level! 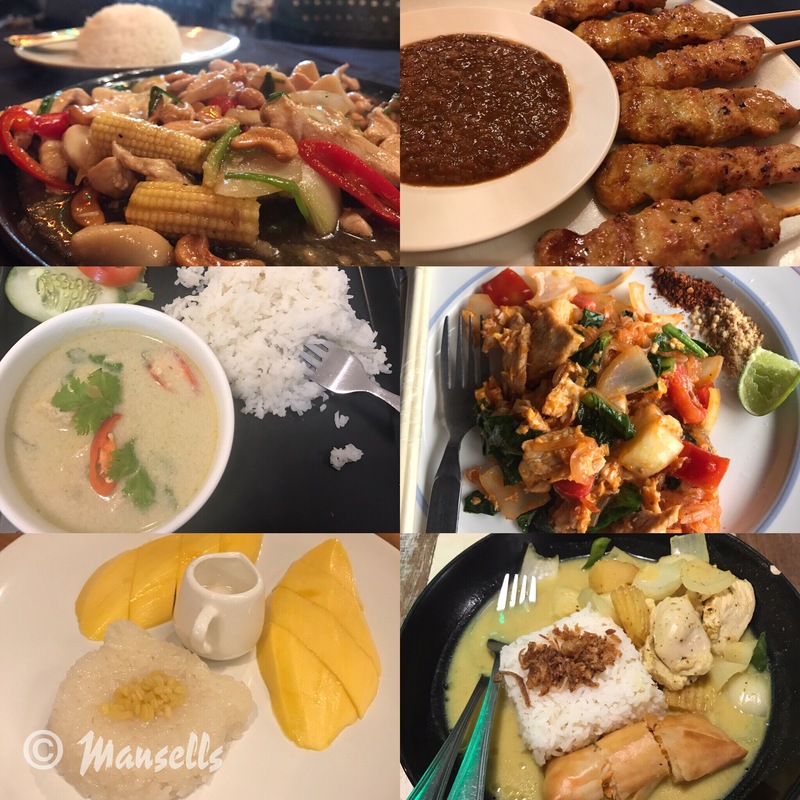 Our favourites were the classic Green Thai curry, Massaman curry, Pad Thai and Mango sticky rice for dessert. We actually went to Bangkok twice; the first time after India and the second time after Vietnam. 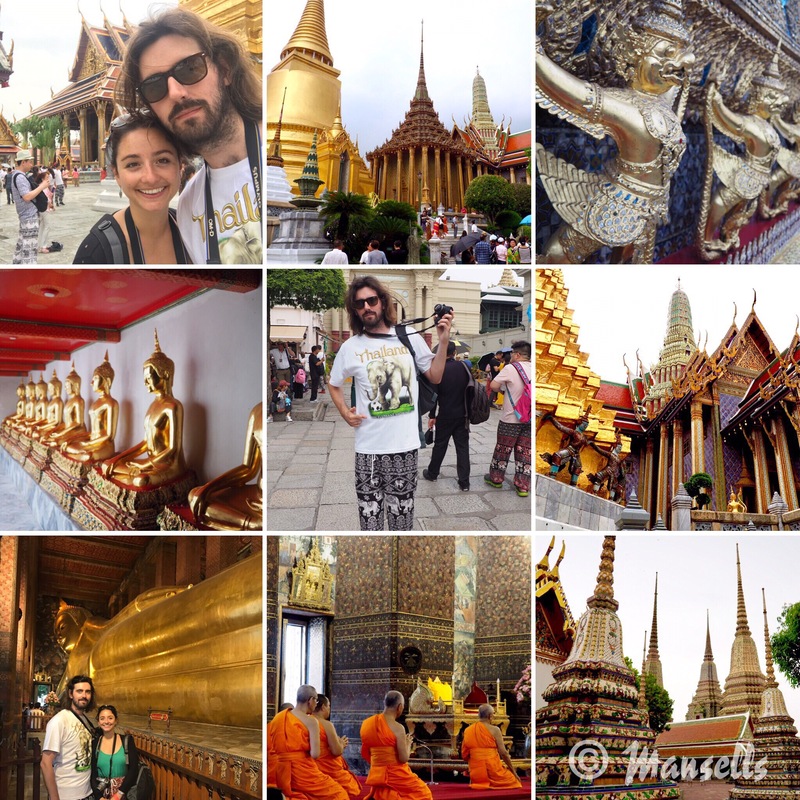 On our first trip to Bangkok we visited the Grand Palace and Wat Pho. Modelling the staple Thailand attire at Wat Phra Kraew and Wat Pho temples. Have you ever seen so much gold? 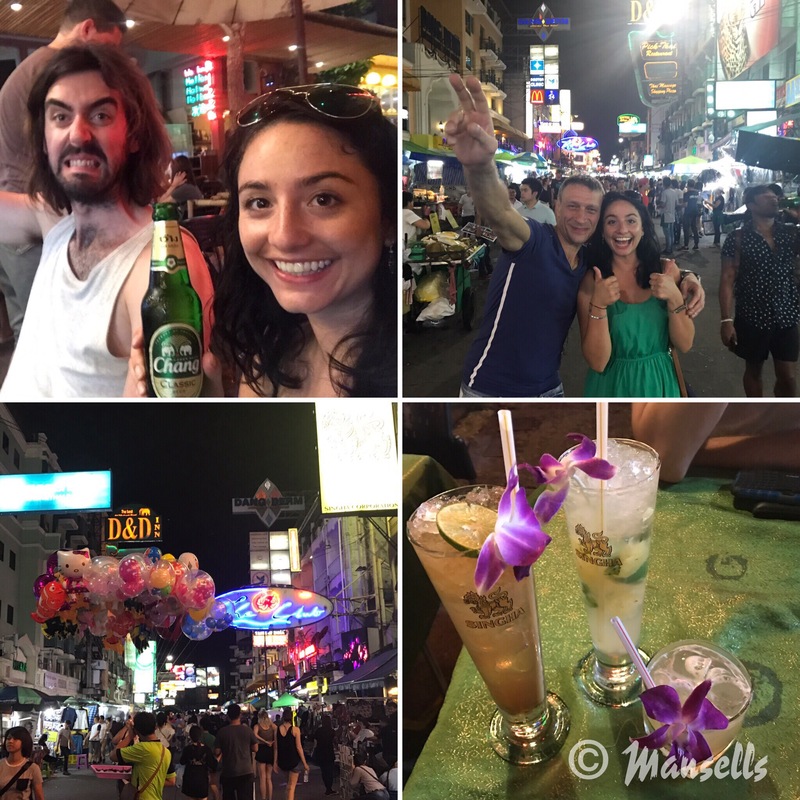 We stayed close to the notorious Khao San Road, a road famous (or infamous) for its bars and restaurants serving alcohol by the bucket. It was really fun, except for the fact I was still recovering from food poisoning in India so we didn’t hit the parties full force. 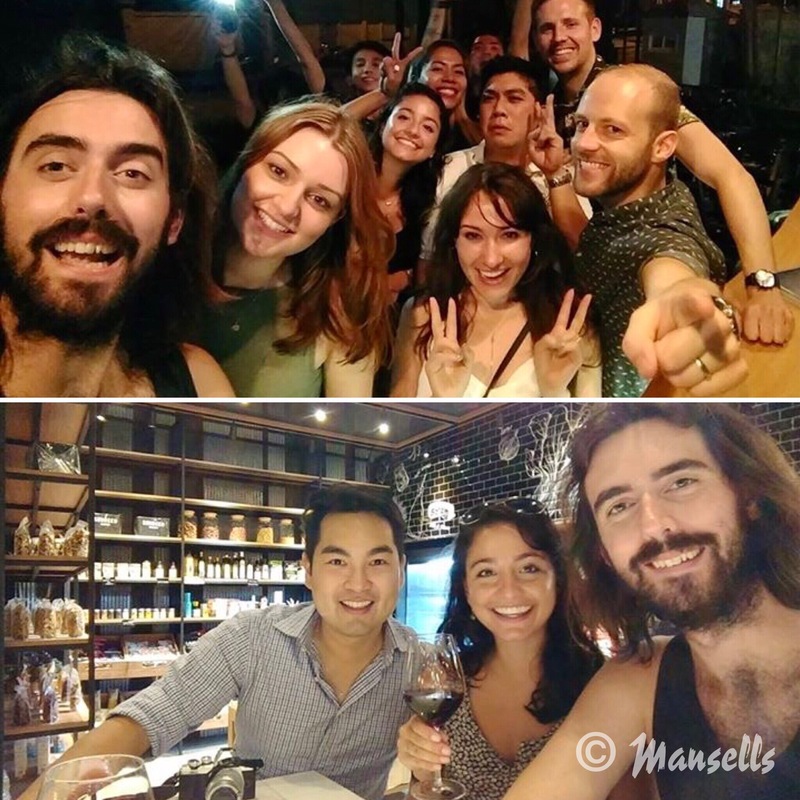 The second trip to Bangkok made up for that though with a lot of socialising and catching up with old friends. Catching up with some old friends in Bangkok. We checked out some of the humongous shopping centres complete with car showrooms and full gymnasiums. We also shamelessly went to Tesco Lotus just because it was like home. Terminal 21 was particularly cool with each level represented by a different country, at the top was San Francisco with delicious food court. 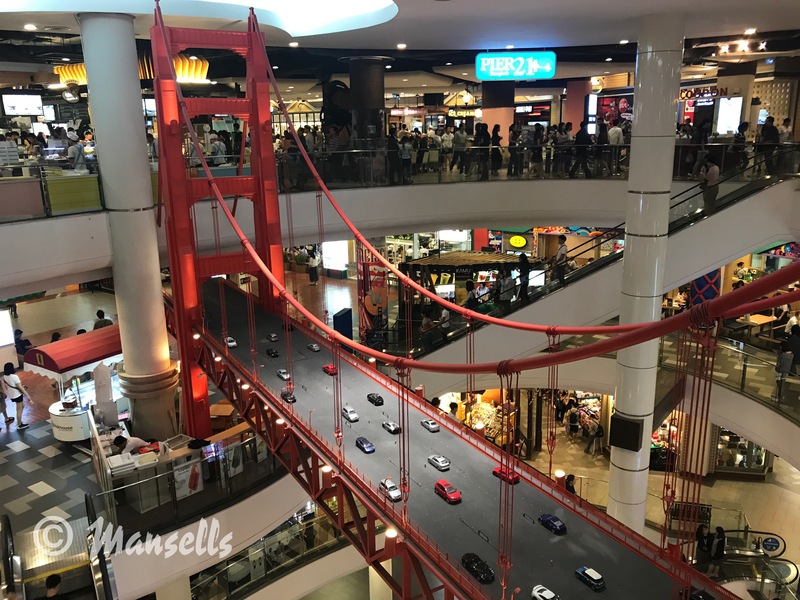 The Golden Gate Bridge… in a shopping mall. 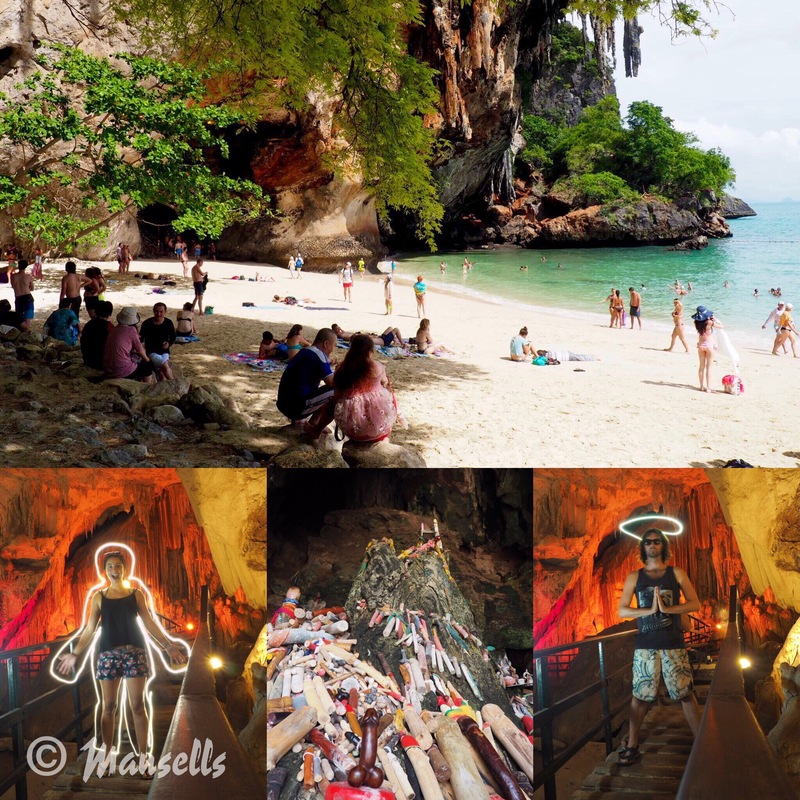 We’d heard only good things about Krabi from other travellers so we decided to make this our next stop. Flights were really cheap too costing about £20 each. 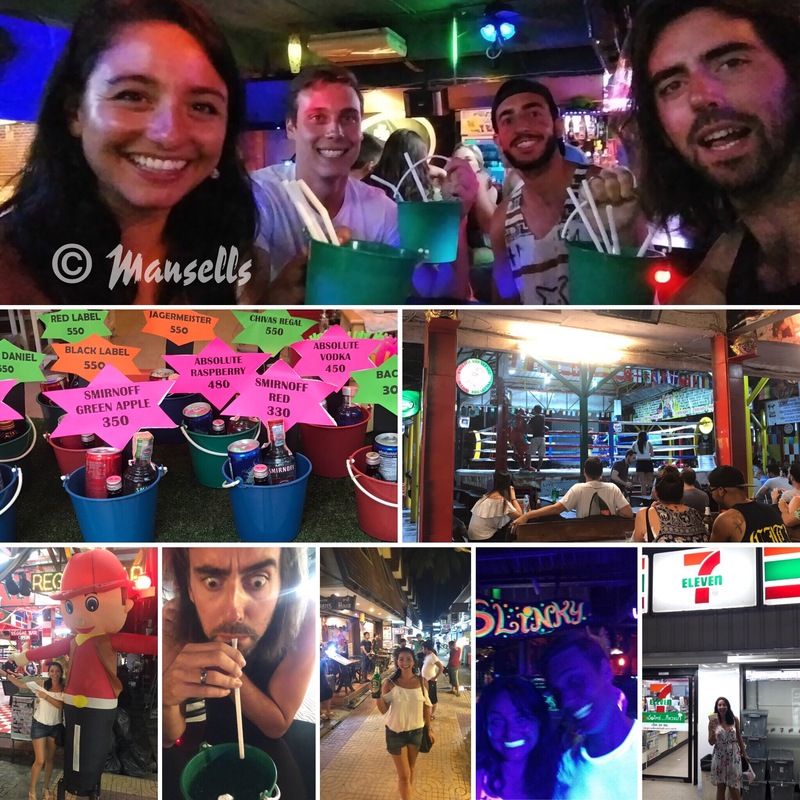 The main attraction of staying in Krabi is for island-hopping, aside from the bar crawls. 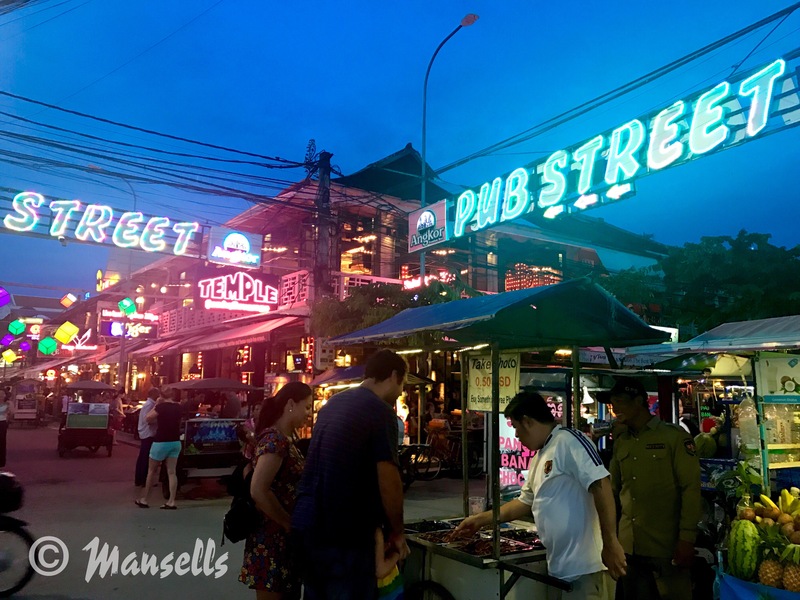 It’s quite a big place and there are numerous places to stay- we chose Ao Nang which sounded like it would be lively and have lot of options for island-hopping. June maybe wasn’t the best time of year for a visit because it was monsoon season. 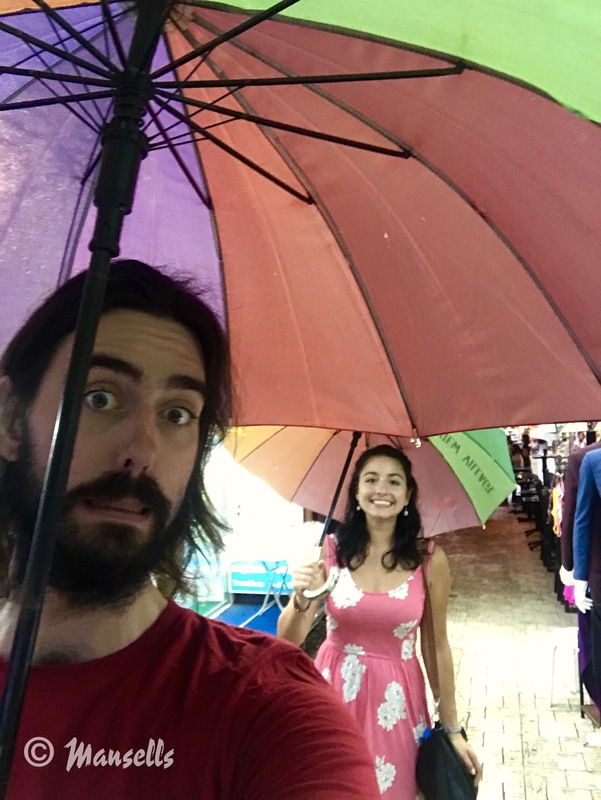 During our time in Krabi, I’d say 70 percent of the time it was overcast and 50 percent it just rained. A Thai massage became a great rainy day activity! 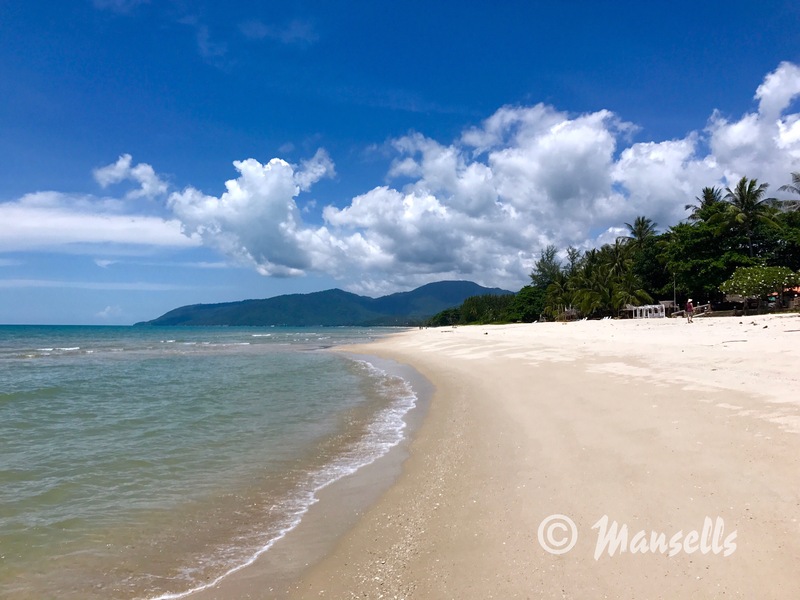 Luckily, we did manage to get some breaks from the monsoon and enjoyed island hopping to Chicken Island (named after it’s shape) and Tup Island which connect by a sand bar at low tide. The first deserted islands we visited via longboat. Pretty darn beautiful aren’t they? 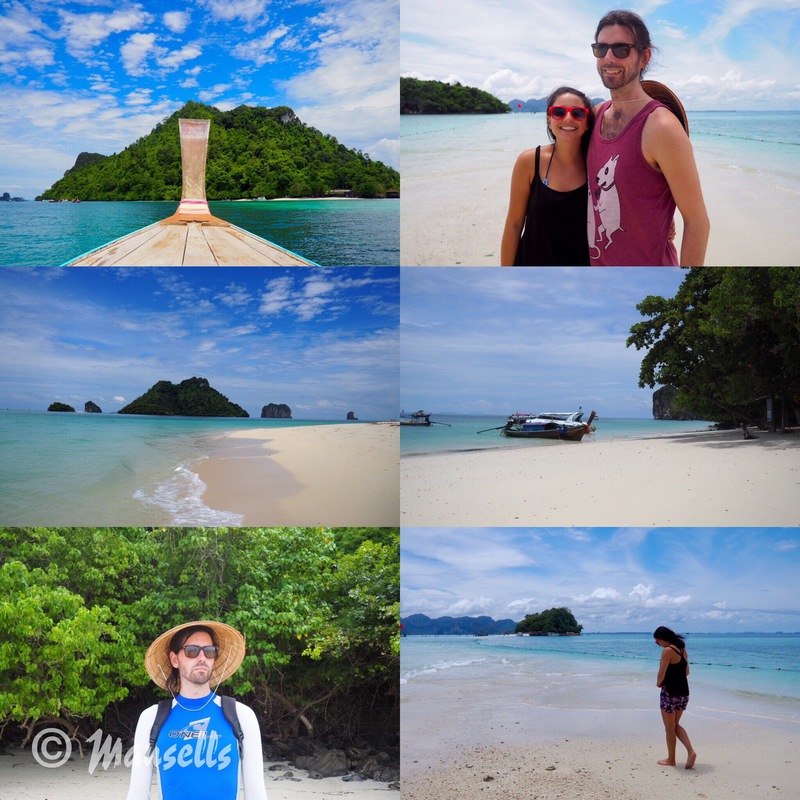 We also went to Railay beach which you can only reach by boat. It had a beautiful cove (and monkeys!) and was popular with rock climbers. There were also nearby caves, one weird cave with penises in and one fairly normal cave (called Diamond Cave). Railay beach and some strange caves. Ko Phi-Phi Don or Phi-Phi island was our next destination. Interesting fact, ‘Ko’ means ‘island’ in Thai. We stayed for just two nights on the party island but managed to squeeze in a lot. 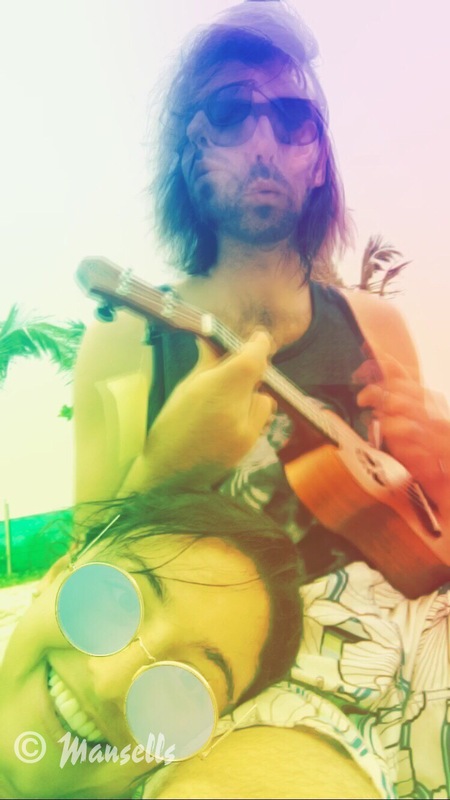 The first afternoon, we got our bearings, stroked one hundred cats and lazed away on the beach with Chang beer and Jonny playing Ukelele. 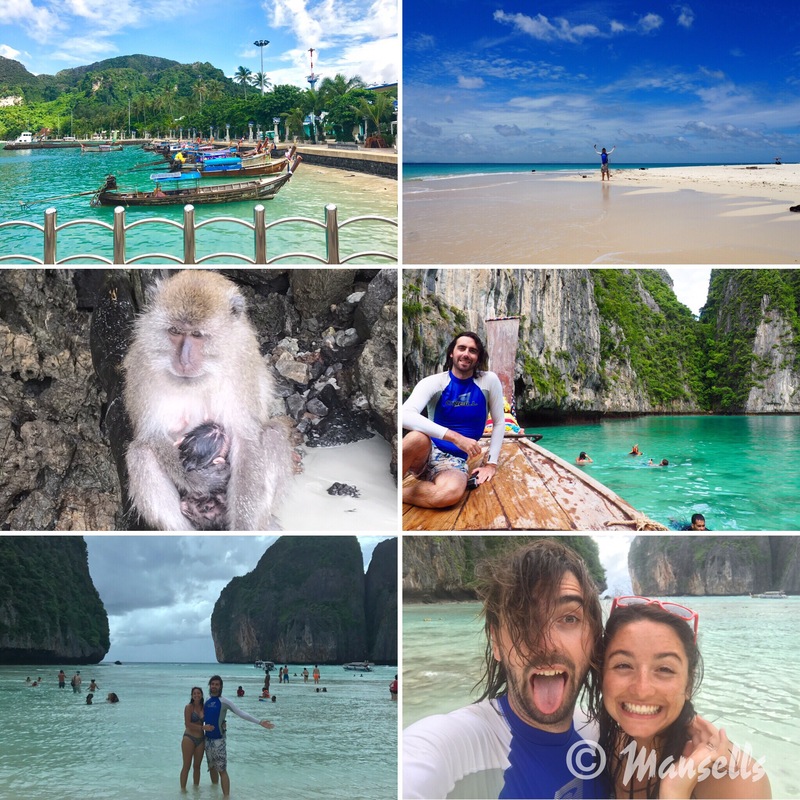 The island-hopping boat trip from Phi-Phi was a full day stopping at the stunning Bamboo island, monkey beach, a gorgeous turquoise pool of water surrounded by rocks and Maya bay – famous because it was where the ‘The Beach’ was filmed. Getting to Maya bay was pretty funny as the water was too shallow for the boat to anchor so instead we had to rock climb and use a net to clamber up to gain access. We could then do the classic run through the palm trees, like Leonardo, to reveal the bay. Though it had got a little cloudy so it wasn’t quite the same beach. Being like Leo and finding not-so-secret beaches (anymore) for the day. Phi-Phi island although beautiful, did have a dark side: alcohol buckets at silly prices (£3.50 for a bucket of G&T), UV paint, beach and pool parties and even a bar with a boxing ring in the middle. As you can see in the photos below, we naturally stayed away from all this nonsense. This was also the night I lost my Thailand 7/11 toastie virginity – a staple most gap year students will mention. Damn that toastie was worth it. This place was our retreat. A non-touristy town compared to the rest of the places we visited, with a beautiful stretch of white sandy beach. It is also home to pink albino dolphins and we were lucky enough to see two on a trip organised by our host. 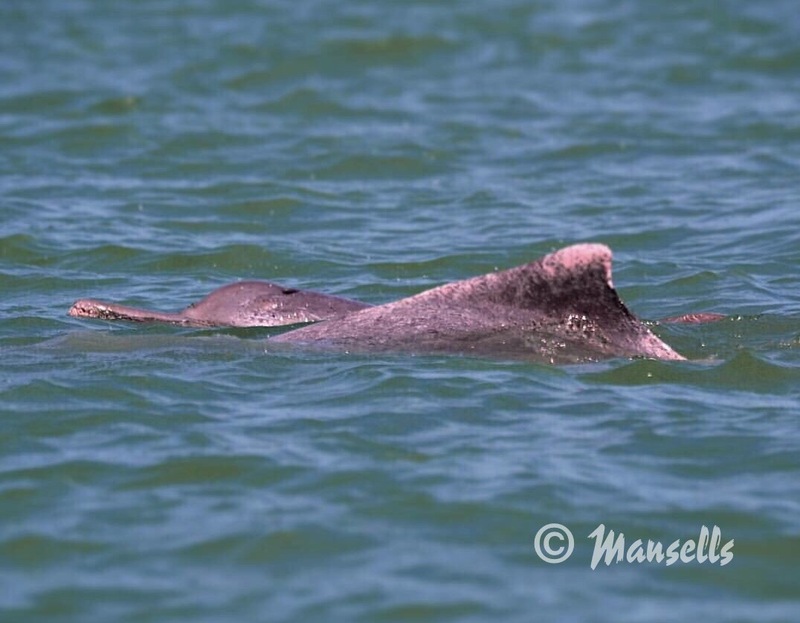 Great 2 second capture by Mr Mansell of the speckled pink Dolphins. 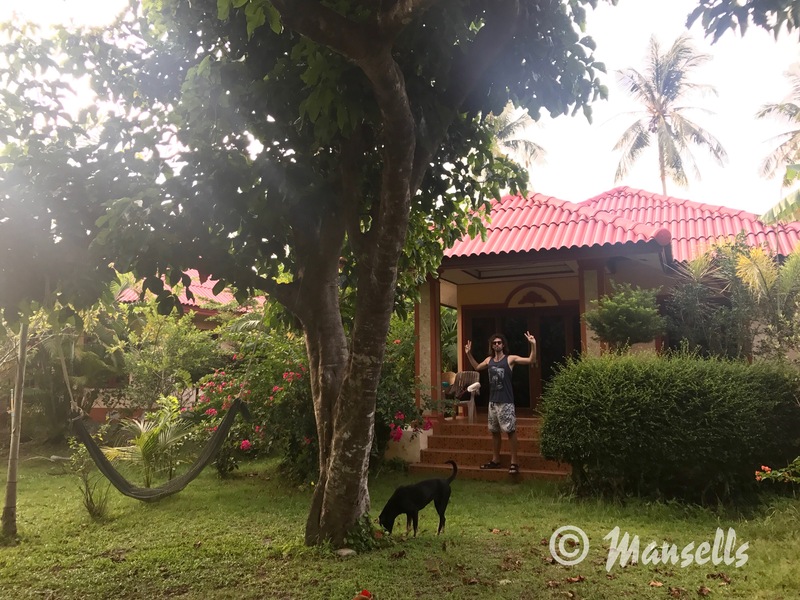 We stayed at a really homely Homestay called Happy Resort and had a small bungalow all to ourselves with a kitchen so we could even make our own food- it was so nice to have cereal in the morning! Our little bungalow complete with dog and hammock free of charge (and husband…just kidding). Other highlights of our stay in Khanom were Hin Lat and Samet Chun waterfalls, the night market and Khanom Seafood restaurant which had an endless list of fresh seafood cooked in your preferred style. Scooters and motorbikes we £3 to rent all day so we took one each to get around. Waterfalls, biking, hiking and eating- what else could you want?! Actually I could answer that, better roads would have been nice! We made Ko Tao mainly a diving trip, planning to do our Advanced Open Water PADI certification. The diving (and snorkelling) was incredible seeing so much underwater life including turtles, rays, barracudas, groupers, parrot and bat fish and more. Sadly, we didn’t get to spot a Whale Shark which frequent the water around this area. 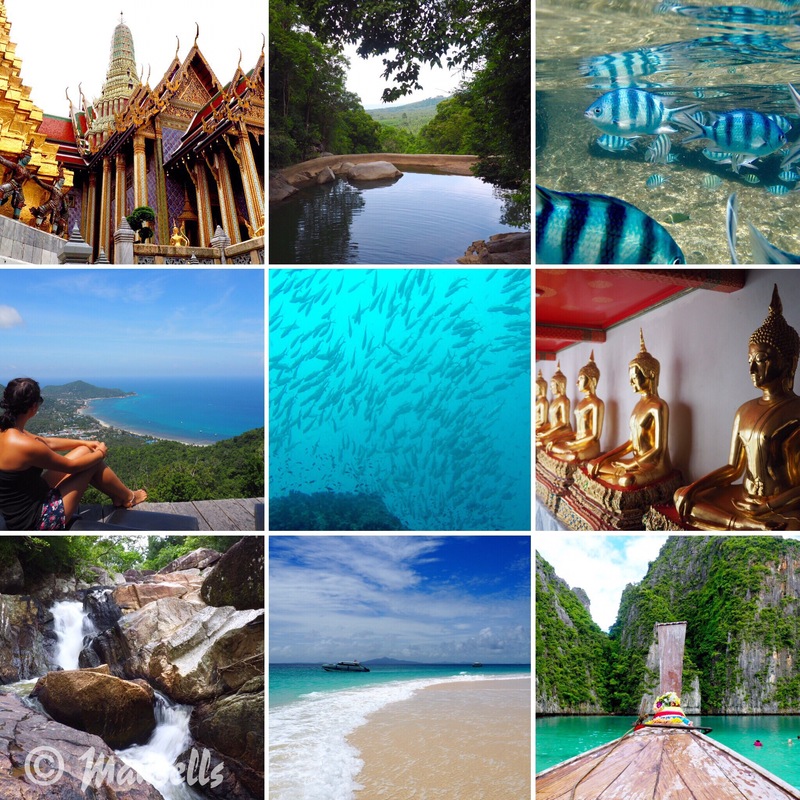 How to even begin to capture the diving and snorkelling to be had in Thailand. We also went to Yuan Island which was gorgeous. 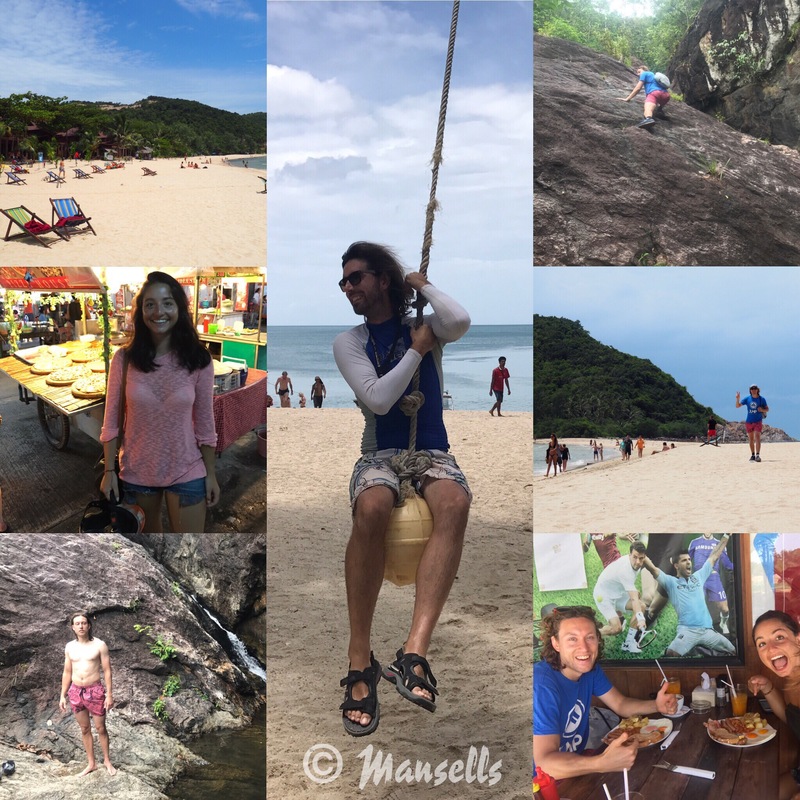 The beaches and snorkelling around Ko Tao were great as well including Tanote Bay, Shark Bay, Freedom Beach and Mango Bay stopping at another view point. 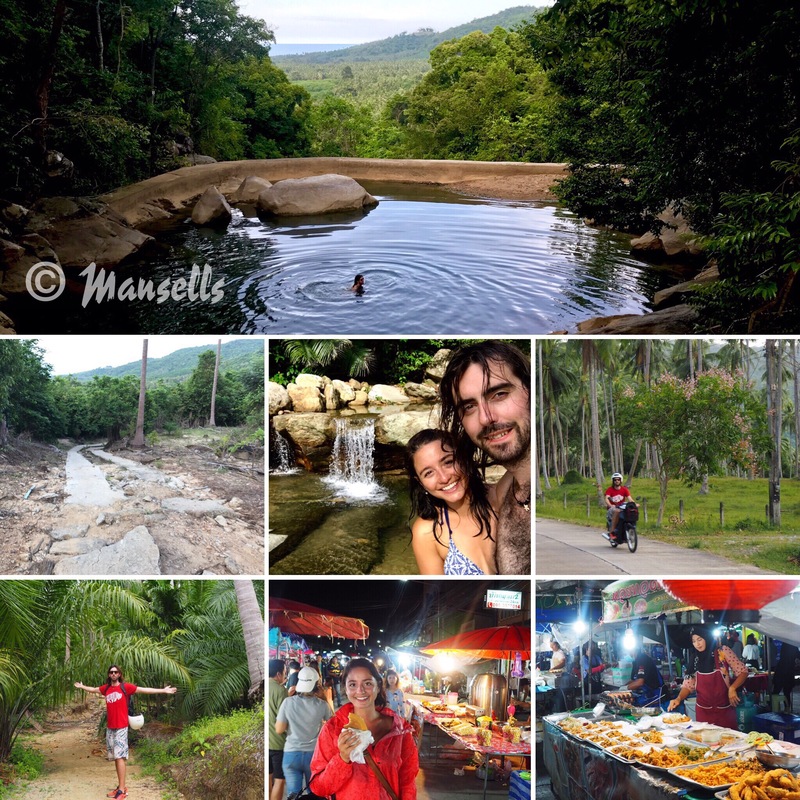 Exploring Koh Tao on our non-diving days. 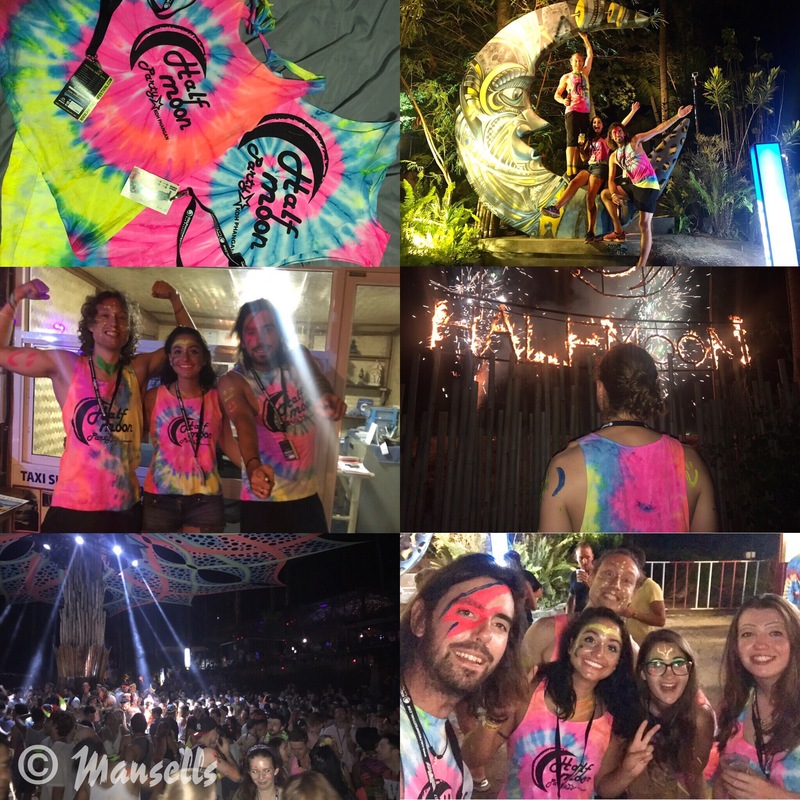 The home of the Full Moon Party! There wasn’t actually a full moon when we went but a half moon so instead we got tickets to the Half Moon party in the middle of the jungle! Josh, our third wheel, who had nothing better to do joyfully came out to meet us in Thailand. We had a lot of fun catching up and nursing his hangover the next day. Besides partying, we enjoyed some of the beaches and waterfalls on the island. Koh Phangan away from the parties. Then it was onwards and upwards to Malaysia! 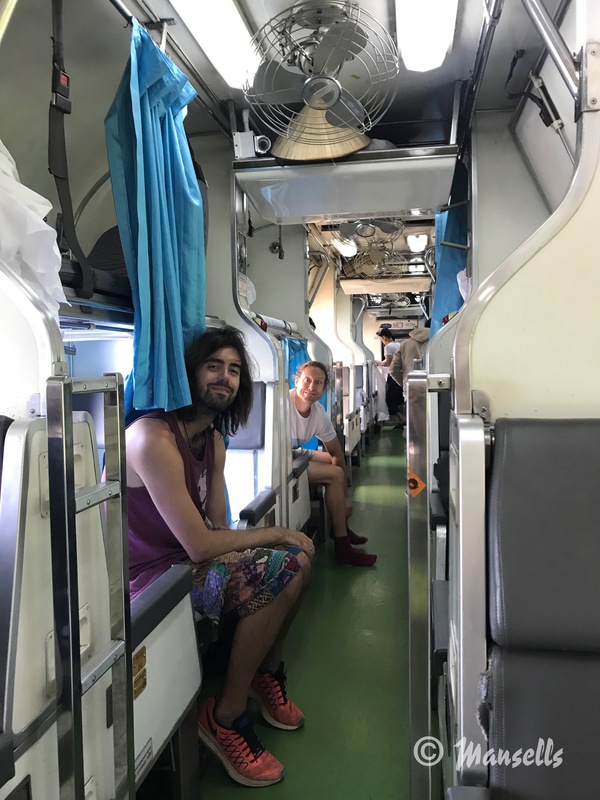 The journey involved a boat, a long drive, one overnight train journey and a second train once we crossed the Malaysian border. It was long but actually didn’t feel too bad, the sleeper train had beds with curtains and all the transport ran very smoothly. 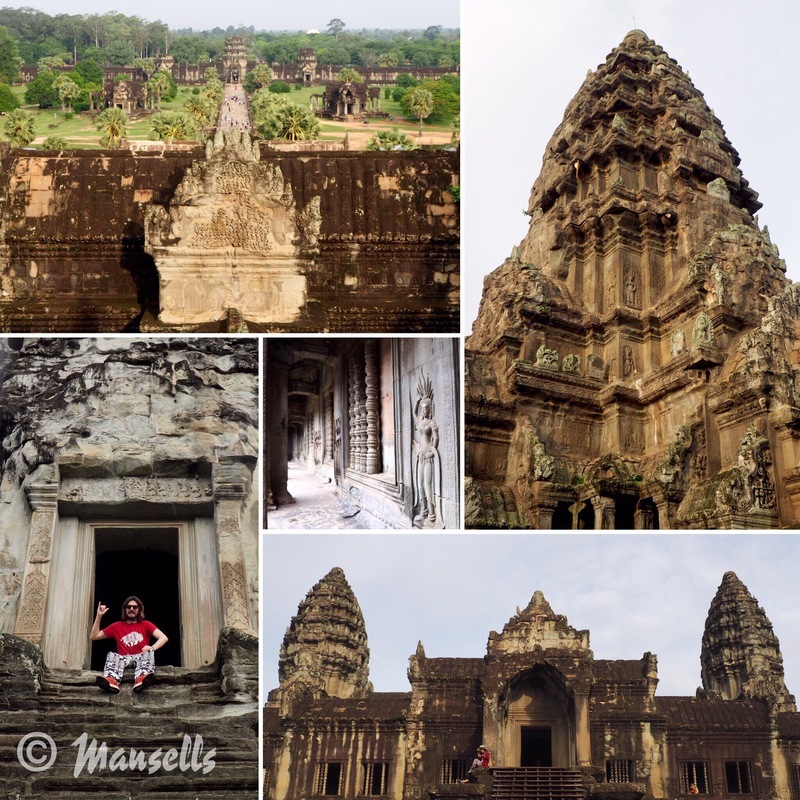 One week is not nearly enough to cover Cambodia so we debated whether to go at all. However, we decided some time was better than nothing at all. 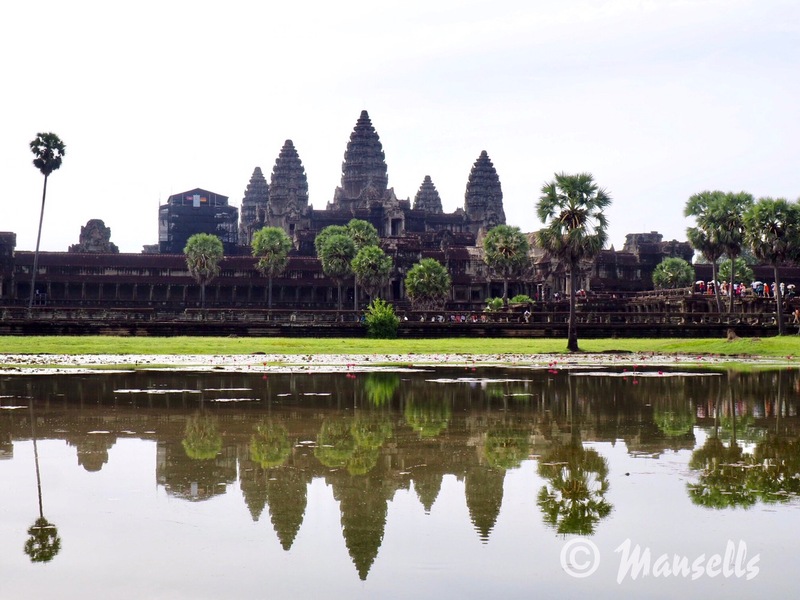 Especially for the temples of Angkor Wat which we distinctly remember topping the ‘Ultimate Travelist’ by Lonely Planet. The temples of Angkor Wat are the largest religious monument in the world and date back to the 12th Century, that’s around 900 years ago. 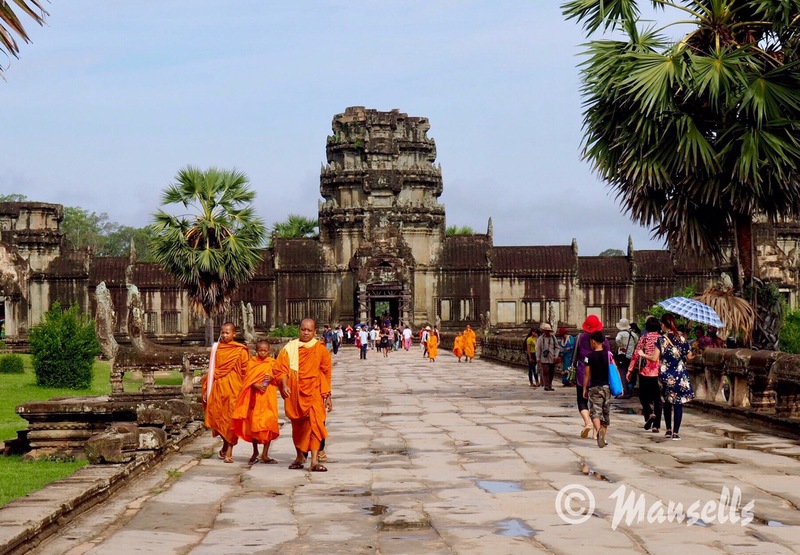 We made our trip to Cambodia part of a shoestring loop from Bangkok, visiting Vietnam as well. It made for a nice 3-week tour around South East Asia before returning back to Thailand and heading south towards our final destination of Bali for our return flight home. 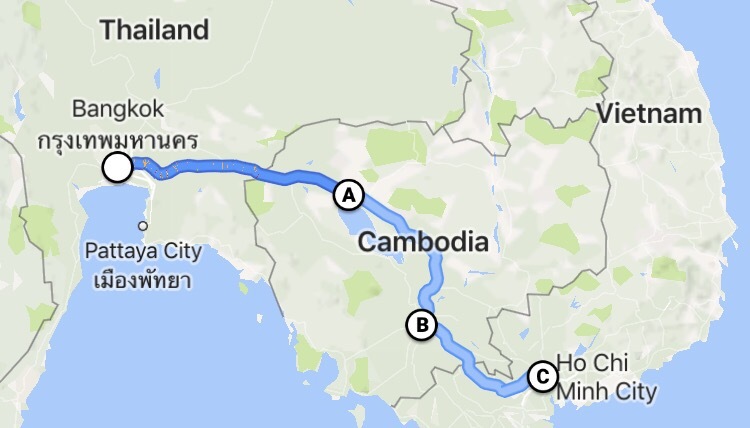 Our route from Bangkok, through Cambodia and onward into Vietnam. Currency: Cambodia uses US dollars which makes it very easy to get currency in advance and exchange any leftover. 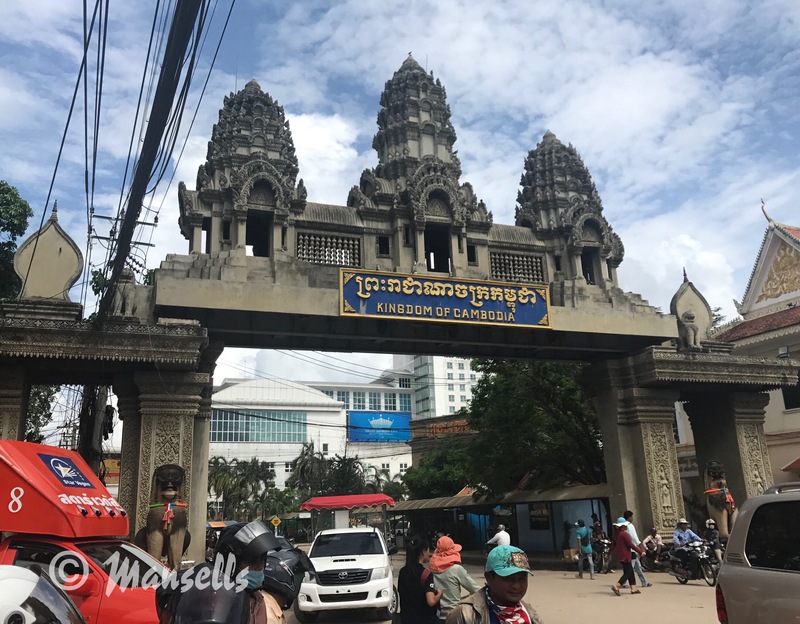 Transport: Buses were certainly the easiest way to travel through Cambodia and were very easy to book online. Cambo ticket in particular shows a comparison of buses so you can pick your preferred choice. All the buses we booked were very efficient including the border crossings. Visas: For UK citizens, you need a visa for Cambodia which costs $30 (bring dollars with you) and you can get this at the border. You need 2 x passport photos (worst case they can do them for you there for an additional cost). We had read lots of stories about scams operating at the border and even the bus we were on dropped us off at an unofficial visa place. The people here immediately started to ask for our passports and passport photos. To be fair they were very efficient. However, they charged 1400 BAHT (about $41) and we could not pay in dollars so we immediately realised it wasn’t the official visa office. We paid it anyway as many other travellers were doing so. Once all the forms were prepared, we had to walk to the border to get our passport stamped and receive a departure card. We were a little sceptical that we were about to be charged again but in the end our visas did actually get processed very quickly. Quicker, in fact, than the few tourists who realised in time to go to the actual border to sort their visa out. 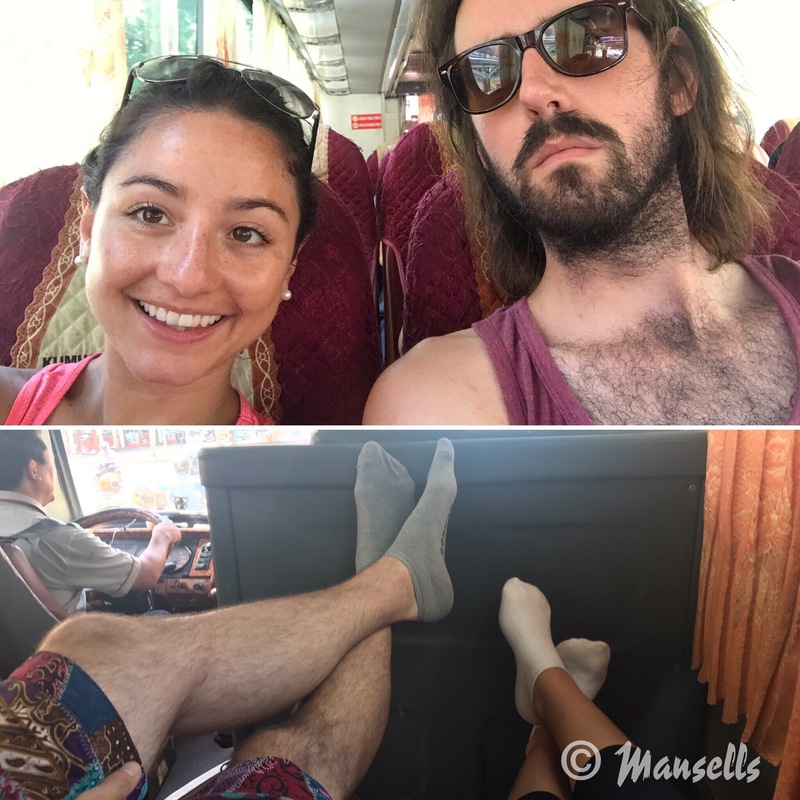 For Vietnam, UK citizens can currently stay for 15 days visa free which is why we could take the bus – this option only works if you already have a visa or like us, you don’t need one. It’s better to fly if you need to get one. We stayed at Villa Sweet Angkor Central, it was really cheap at £11 for both of us per night and our room even had two double beds! The hotel also had a small swimming pool which was great given we were nowhere near the sea. Room to spread out in our accommodation in Siem Reap for only £11 a night! Jonny doing his best seal impression in the pool. It was a bit of a walk to Pub Street (the street is actually called ‘Pub Street’) which is where all the bars and a lot of restaurants are. This street was really good fun and beers were as cheap as $0.25!! Pub Street in Siem Reap! The next day we took it easy and had a wander around the town. We found a great bakery called Bloom Cafe which had the nicest coffee and cakes! 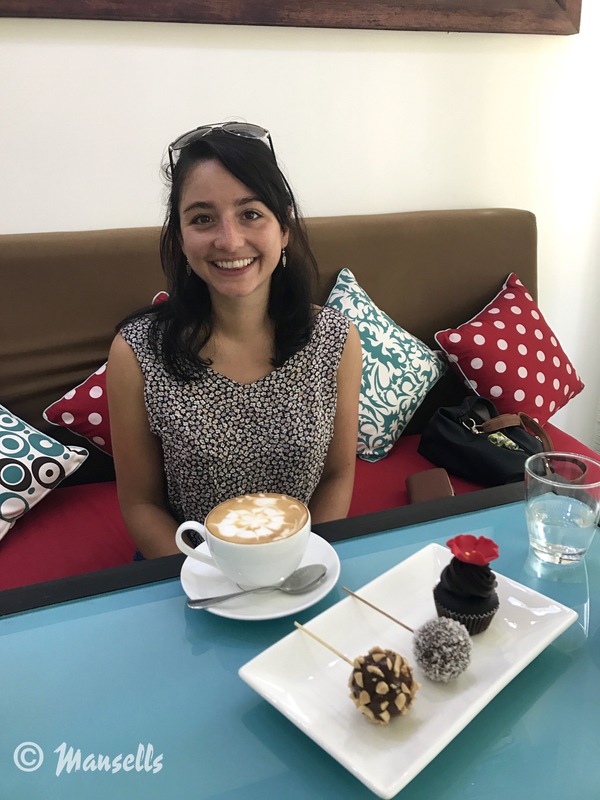 Beautifully presented coffee and yummy treats at Bloom cafe in Siem Reap. For Angkor Wat, the temple complex is too big to walk around so you can either hire a tuk-tuk for the day, cycle or hire scooters/motorbikes. We found a place offering electric bikes which we thought might be fun (and more eco-friendly) costing $10 for 24-hours. The lady in the shop told us we could get tickets for Angkor Wat from 5pm the day before and see some temples that same evening. This worked out well as it made it easier for us to get to the temples for sunrise the next day which had been heavily recommended by everyone we met. As we rode to the ticket office, a monsoon from hell came down and we got absolutely soaked from head to toe. It was pretty hilarious walking up to the ticket counter leaving a puddle behind us. 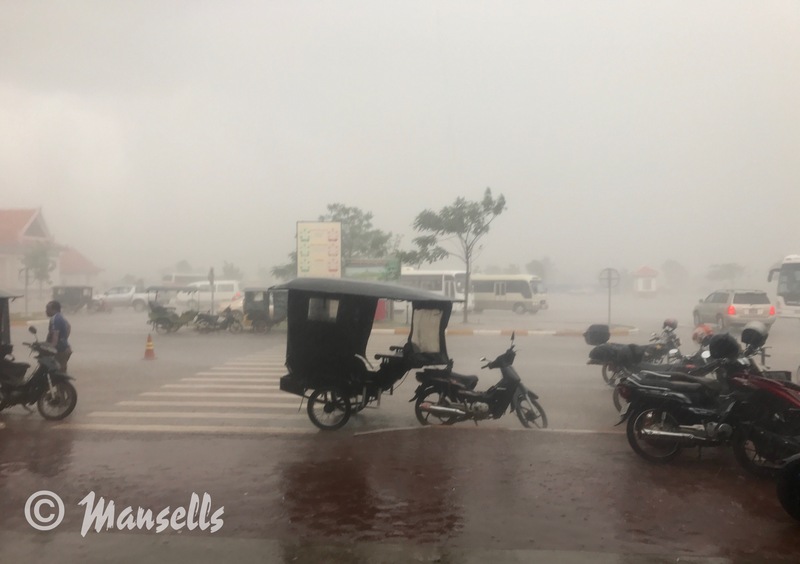 The monstrous monsoon which came down whilst we were riding to the ticket office. 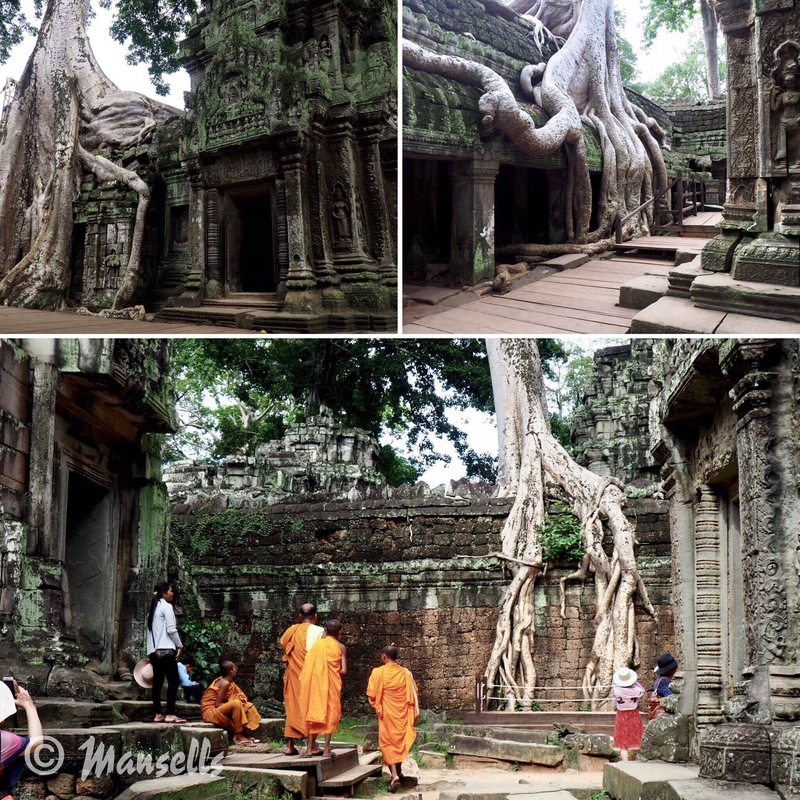 You can either get 1, 3 or 5 day tickets for the Angkor Temple complex. We decided on 1 day tickets and although we did not see everything on the site we felt it was enough for us – you can get a bit ‘templed’ out in the heat if not careful. 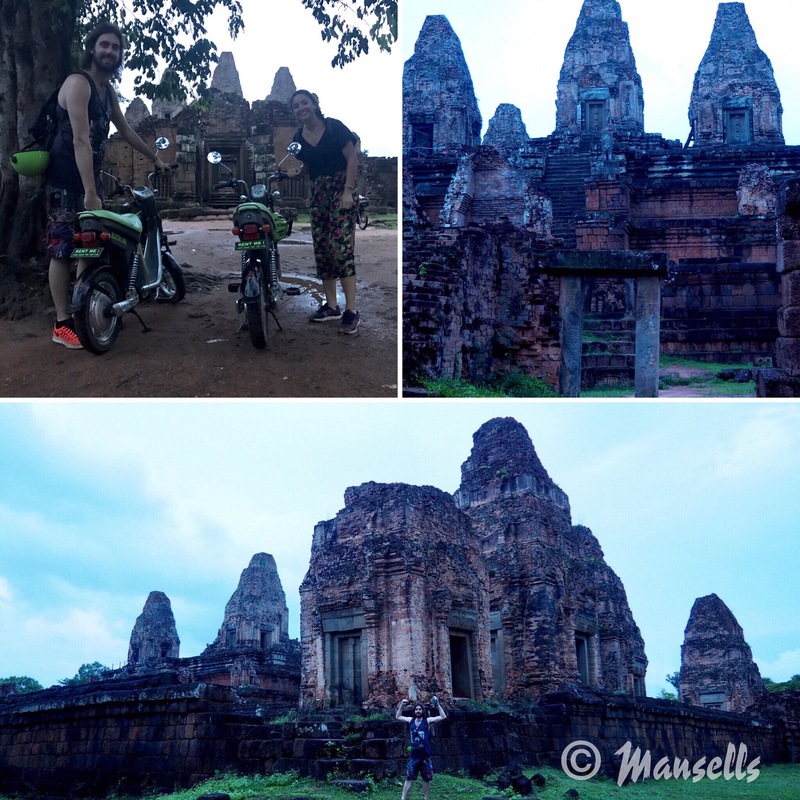 After we’d got our tickets, we decided to check out one of the temples that was open until 7.30pm, Pre Rup temple. Testing the bikes out we went to see Pre Rup temple in the evening. The way back was funny as we had to ride the bikes no more than 14 kph or risk the bike running out of charge and having to use the most ridiculous looking pedals! We made it back eventually haha. 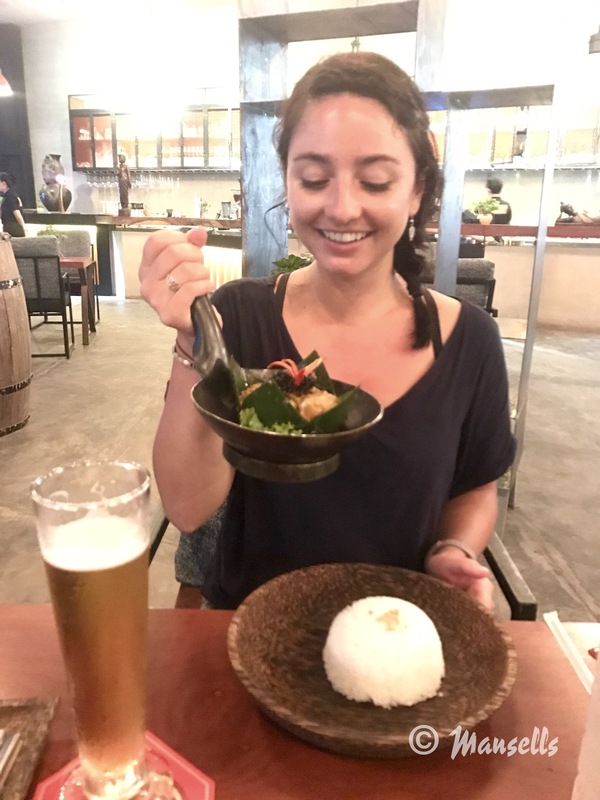 After a quick shower, we went out for our first taste of Cambodian food at what became one of our favourite restaurants, Temple Design Bar, which was just a few streets back from Pub Street. We tried the Amok curry which was delicious. Bright and early the next morning (a crazy 5.45am), we set off on our freshly charged bikes (we had to charge the batteries in our room overnight). 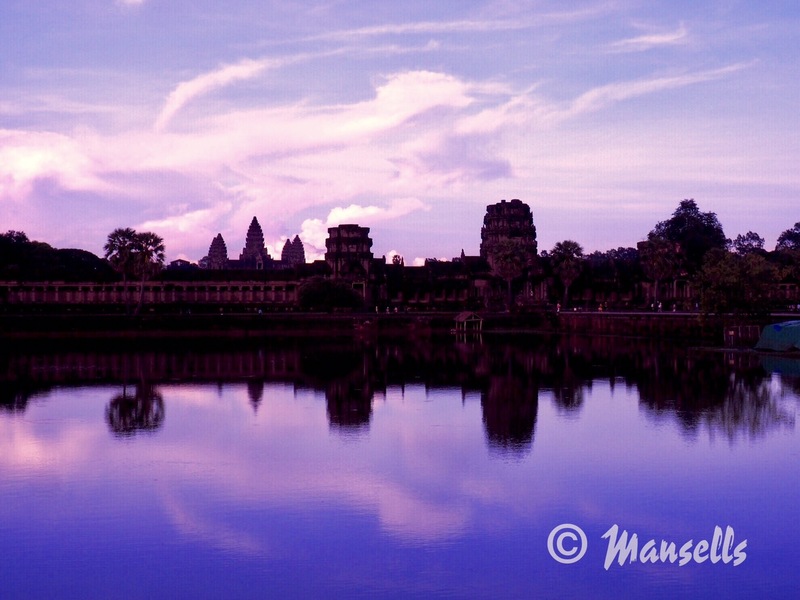 We arrived at probably the most famous and well preserved temple, Angkor Wat, for sunrise. It was pretty spectacular, even if it was cloudy. Angkor Wat bright and early. There was a monk giving prayers to tourists. Monk blessing me (I think!). We spent time looking around the temple and you could even go up one of the spire towers. Next we went to Bayon Temple which is known for the faces carved into the rock. 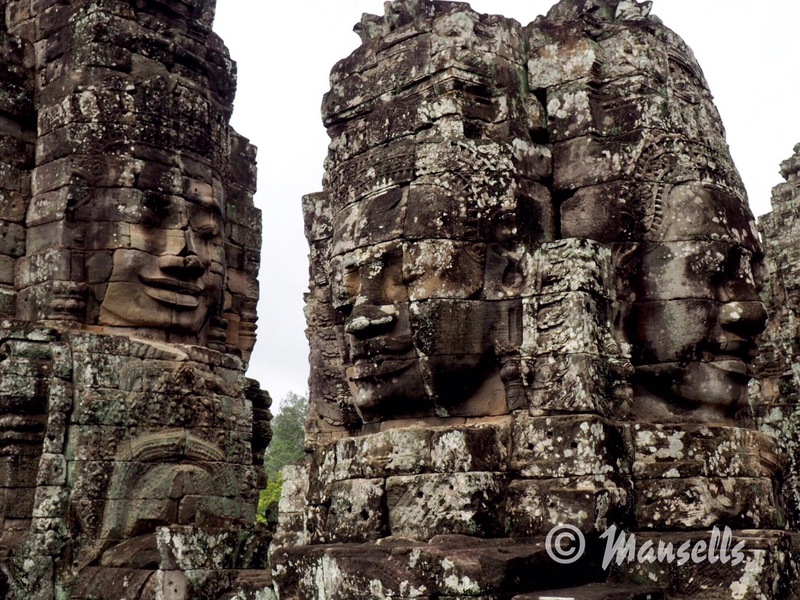 The faces carved into the rock at Bayon Temple. Here, we witnessed the sun have a surreal ring around it which was really incredible. 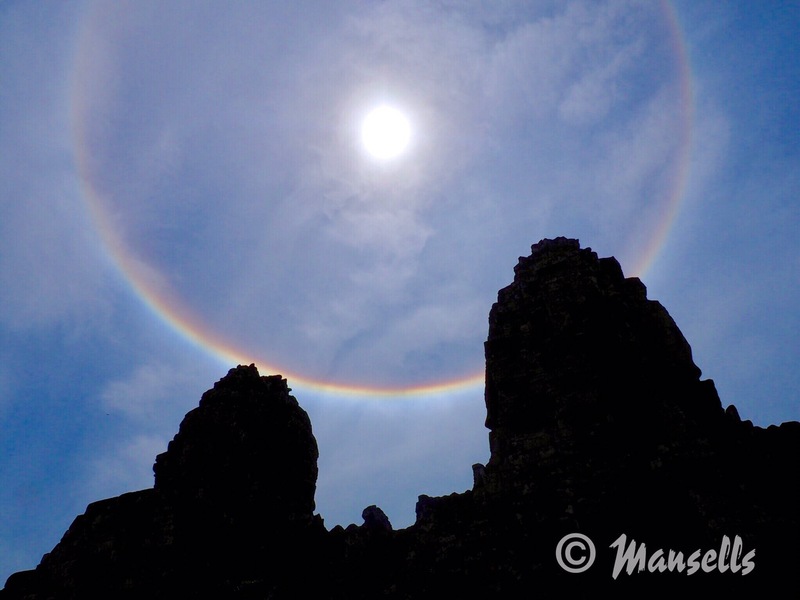 Amazing rainbow ring around the sun above Bayon Temple… does it mean something perhaps?! We had to stop to charge up the bikes, but used the time to have an early lunch. 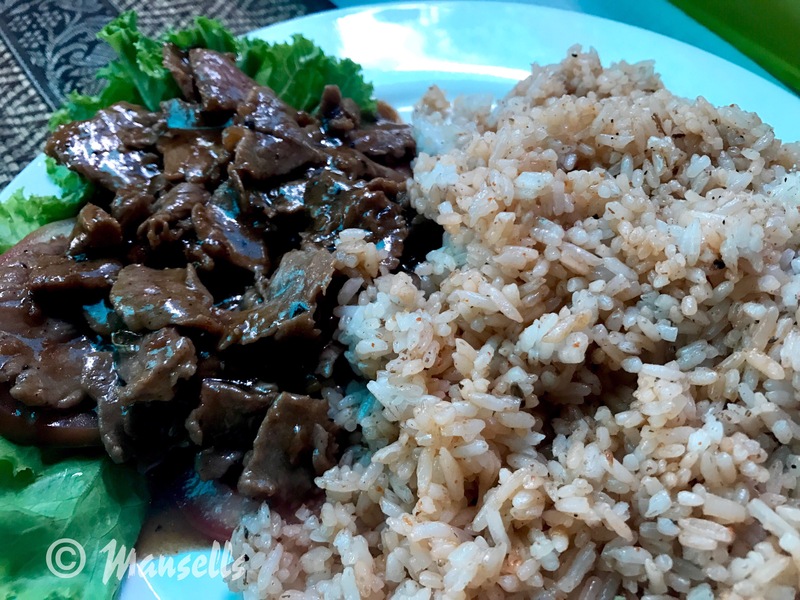 We tried Beef Lombok, another traditional Cambodian dish. Cambodian Beef Lombok. 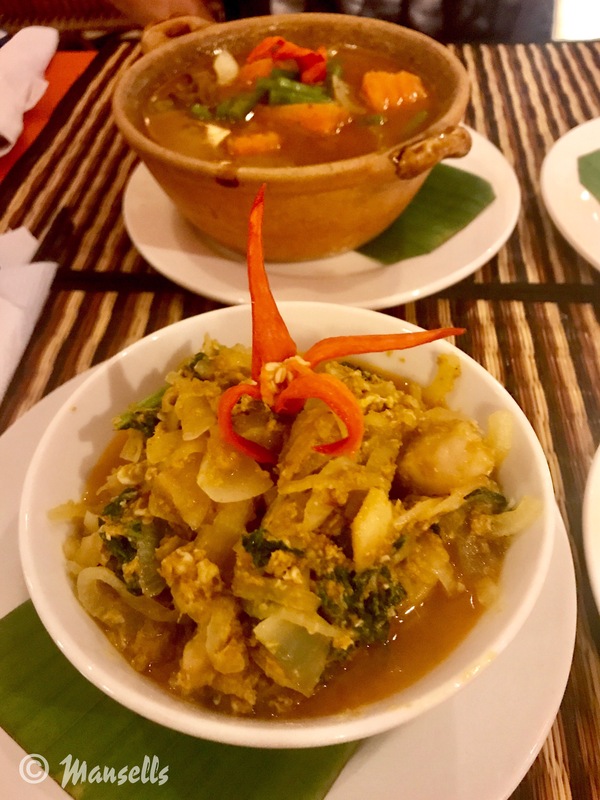 To be honest, we preferred the Amok and Khmer Cambodian curries but it was still good! Next we visited the main gates and a few more temples around the site. The scale of the temple complex is difficult to comprehend until you are there! Even the butterfly in the photo needed a rest! Ta Prohm temple (below) is famous for being used in the film Tomb Raider. It has trees literally growing through the temple walls. Ta Prohm temple, best known for featuring in Tomb Raider. Finally we watched Angkor Wat as the sun begin to set, before making our way back. Angkor Wat as the sun was setting. Enjoying a big BBQ plate and beer after a long day at the temples. 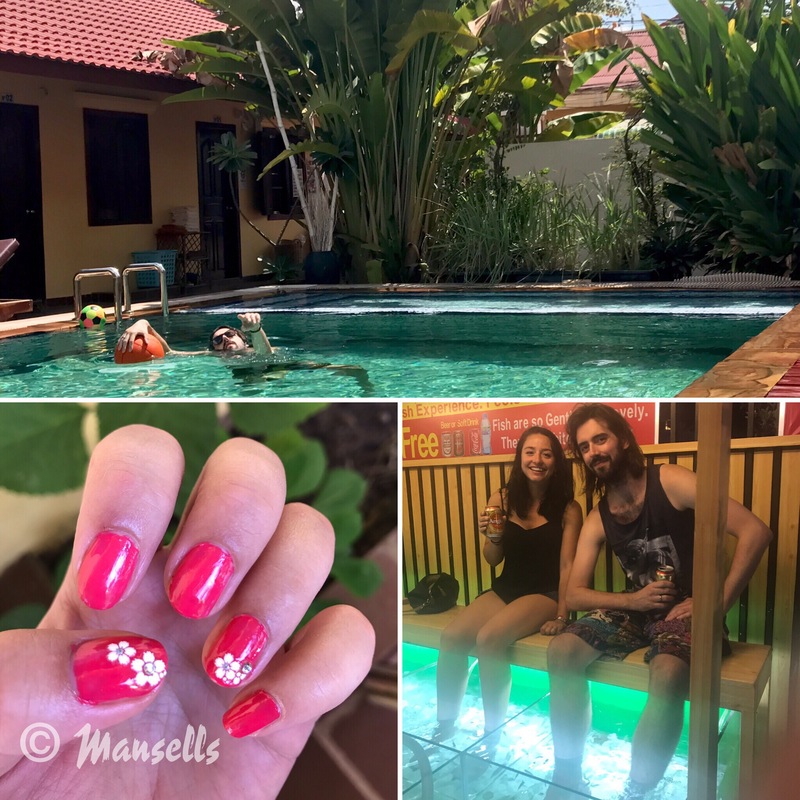 For our final day in Siem Reap we decided to spend most of the day relaxing by the pool and having a bit of pampering. I got my nails done for $2 and we both had a fish foot massage with free beer! Chill out and pamper day- Jonny loved getting his nails done 😉 The fish spa came with a free beer- result! 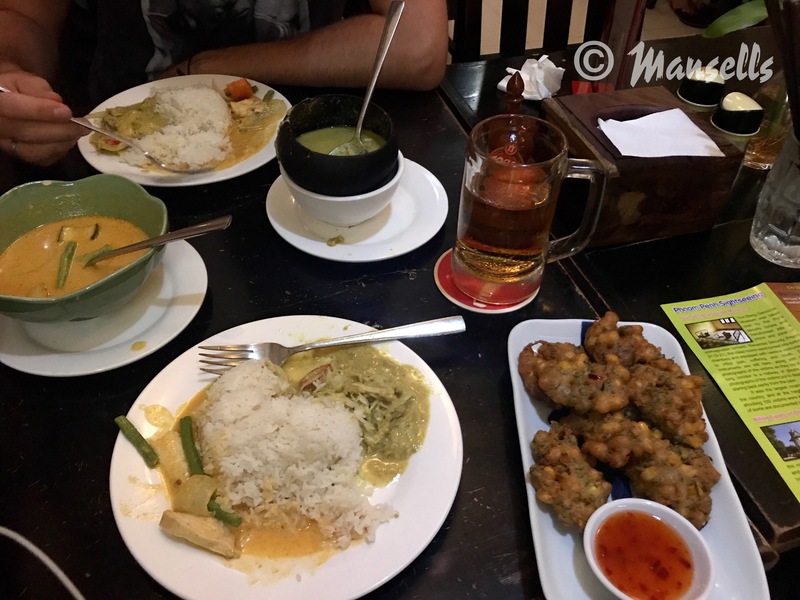 ﻿We had the best curries at Cambodia Tradional Chef – the fish Amok and beef Khmer curry were really good. The bus to Phnom Penh was again very simple. It was a small minibus which departed from the main post office. The bus stopped for a break on the 6 hour journey at a beautiful location. We have no idea where this was as the bus stopped us here for a break on the way to Phnom Penh, but isn’t it beautiful? 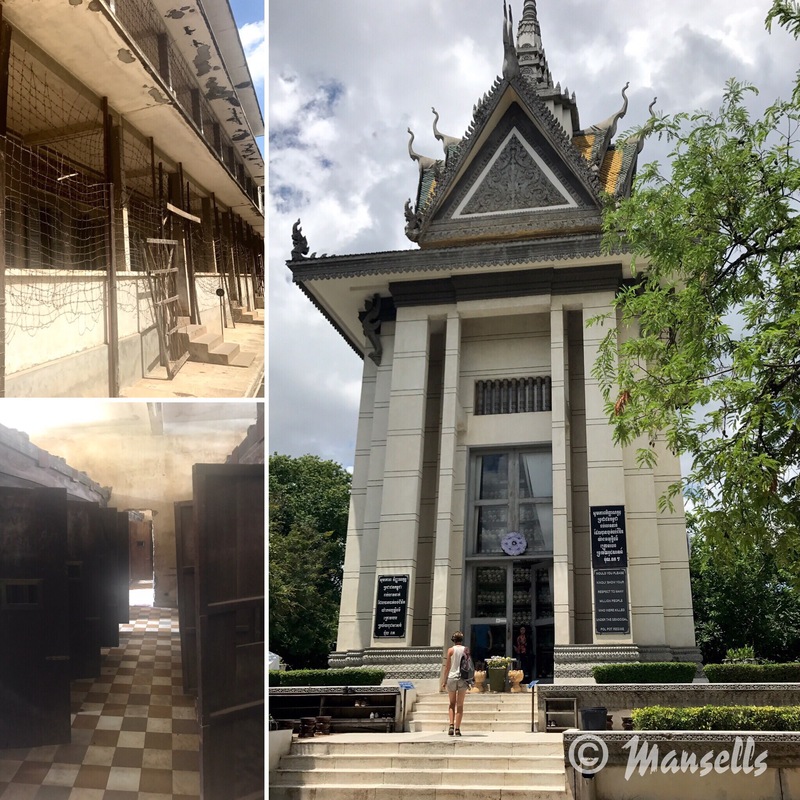 Sitting on the bus for so long enabled us to catch up with House of Cards on Netflix 😉 We also met fellow travellers Don and Adam on the bus, and decided to meet the next day to go to S-21 Tuol Sleng Genocide Museum and the Killing Fields. If you haven’t heard of the Khmer Rouge regime or the history around this, I urge you to read up on it. It’s likened to the Holocaust. We didn’t take many photos of these places as they were extremely harrowing. I’d certainly recommend a visit and the audio guide was well-done. 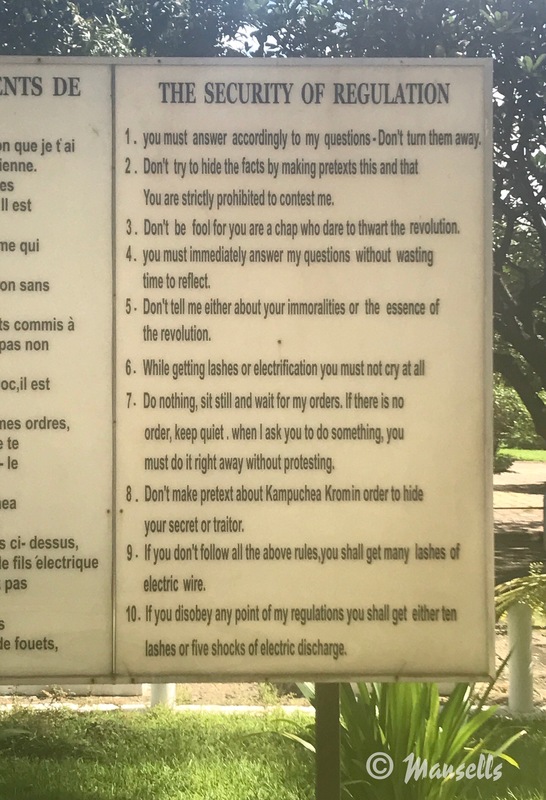 The terrifying rules as S-21 prison, a former school, used during the Khmer Rouge regime. One of the rules reads ‘Whilst getting lashes or electrification, you must not cry at all’. On the left is S-21 prison and on the right is the memorial for those that lost their lives at the Killing Fields. That afternoon, we needed something much lighter so we did what many Brits do and went to the pub. 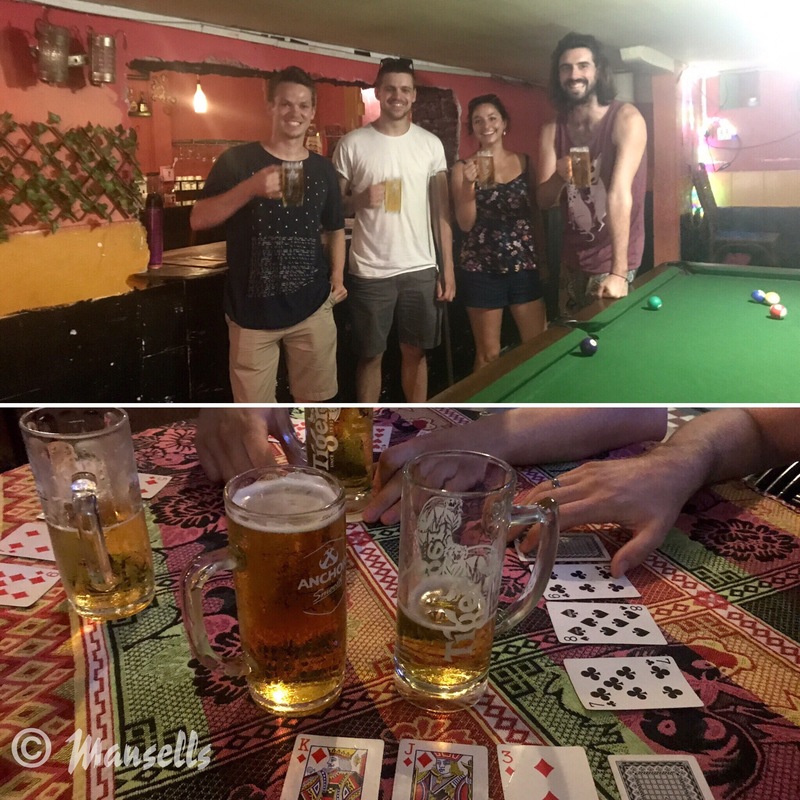 We were still with Don and Adam and enjoyed a few rounds of pool, some drinking games and a lot of beer together! A bit of light relief after the horrific stories from Tuol Sleng Genocide Museum and the Killing Fields. Sensibly realising we needed to sober up, we decided a Khmer massage would be the best approach. The massage though, was actually really good and involved a lot of stretching (or the beer helped to mask the pain…). Our accommodation (Longlin House) was in an area equivalent of pub street in Siem Reap. It was great for restaurants but it was a little seedy with many prostitutes outside the bars. We did find one great restaurant called Kabbas Restaurant which had really good Cambodian curries. More Cambodian curry. Literally couldn’t get enough of this yummy stuff! 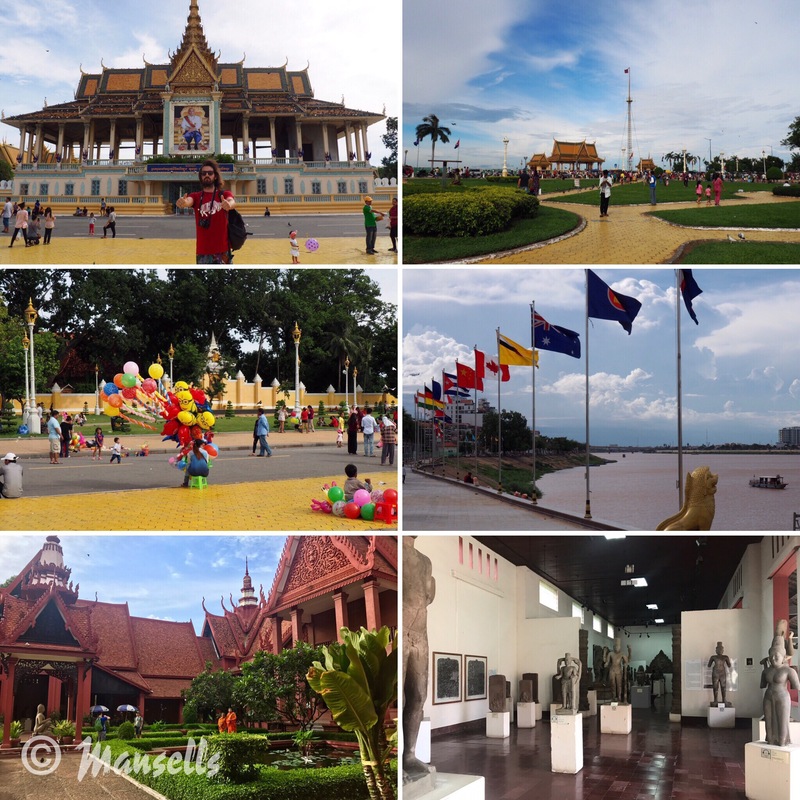 Our final day in Phnom Penh was spent wandering around the Royal Palace (it was closed so we didn’t go inside), the river, central market and the National Museum of Cambodia (personally we didn’t feel the museum was worth the $5 entrance fee). A day in Phnom Penh. 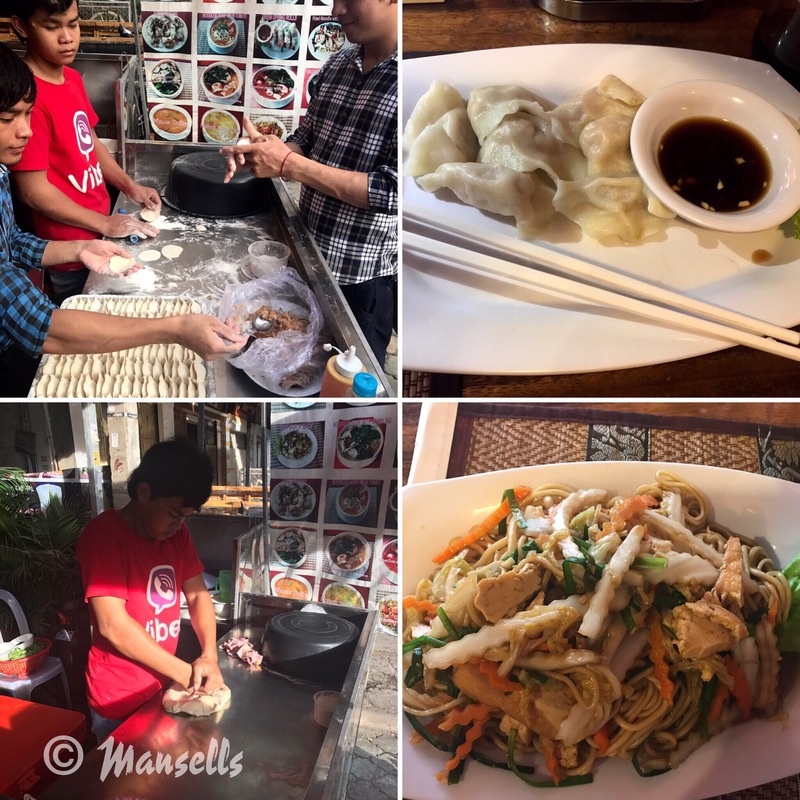 We had a late lunch at David’s Handmade Noodes restaurant but the handmade dumplings were even better! Handmade noodles and dumplings made right in front of us at David’s in Phnom Penh. Then it was on to Ho Chi Minh city or Saigon in Vietnam. We were pretty chuffed when the seats we’d booked had extra leg room! Happy travellers leaving one great country to another! So there you have it; both breathtaking and unforgettable experiences, the tastiest food, good company and lots of fun. 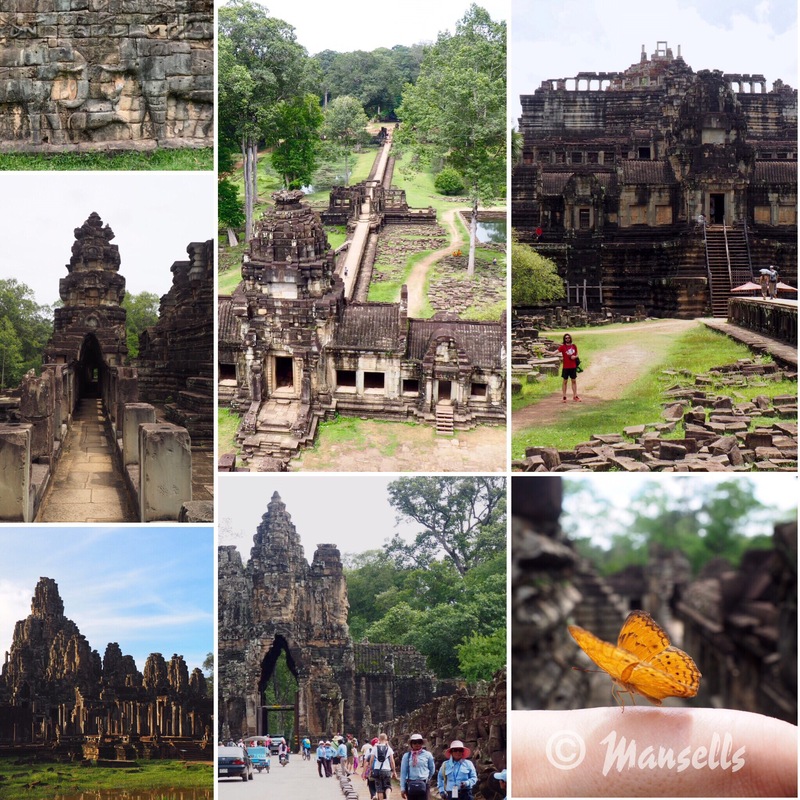 Safe to say we enjoyed our 1-week visit to Cambodia!